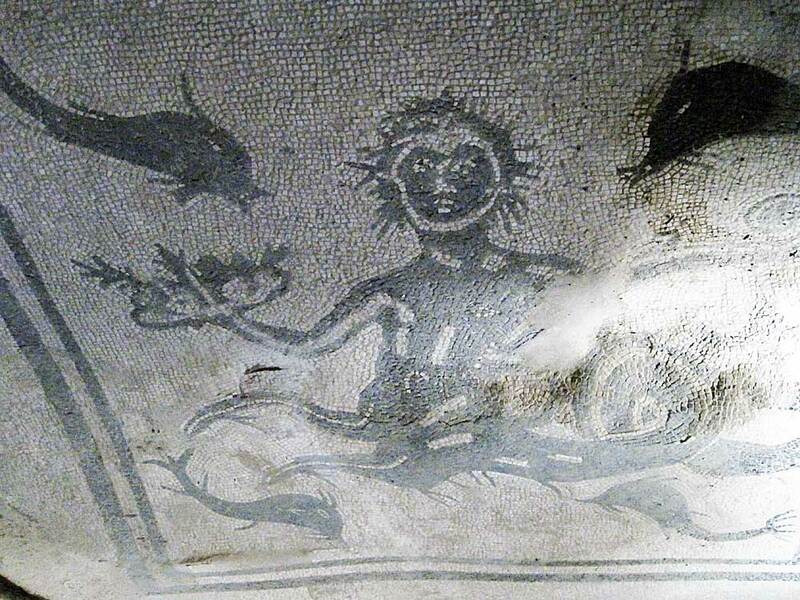 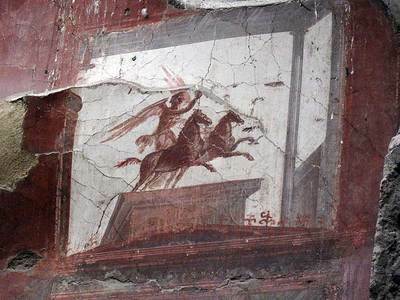 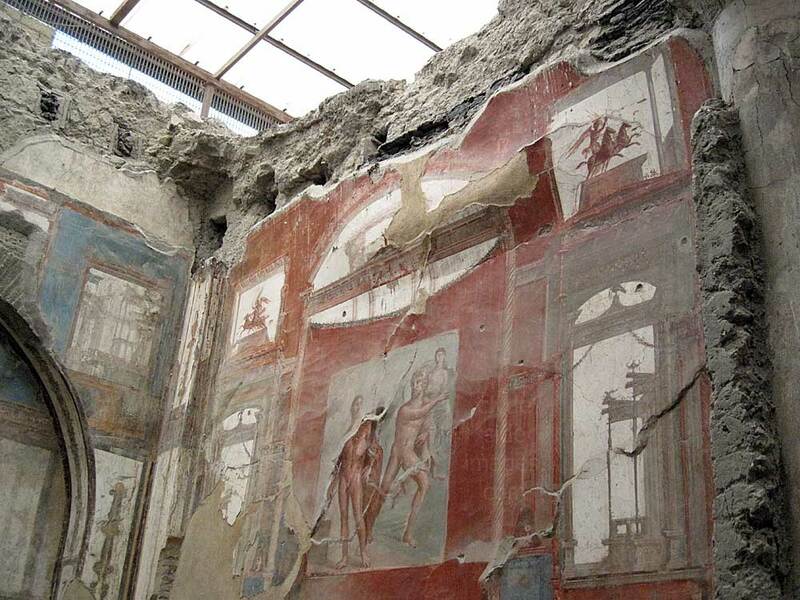 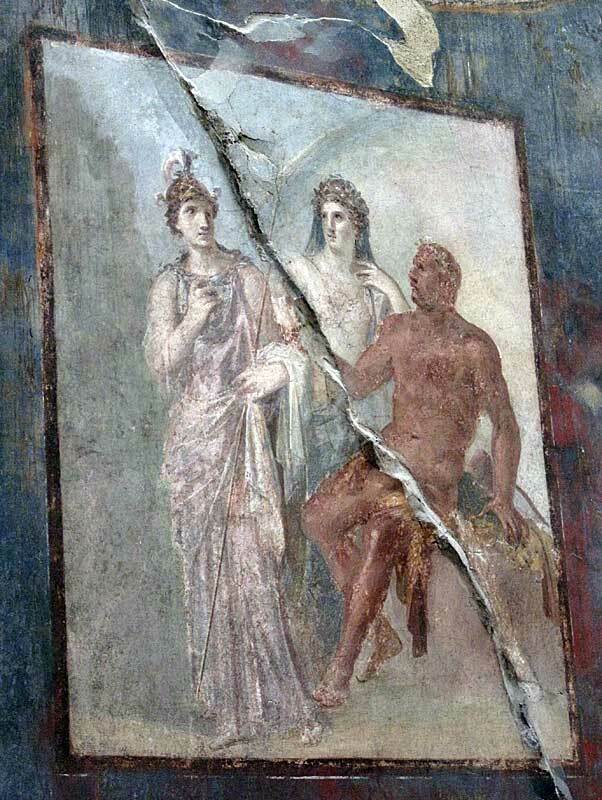 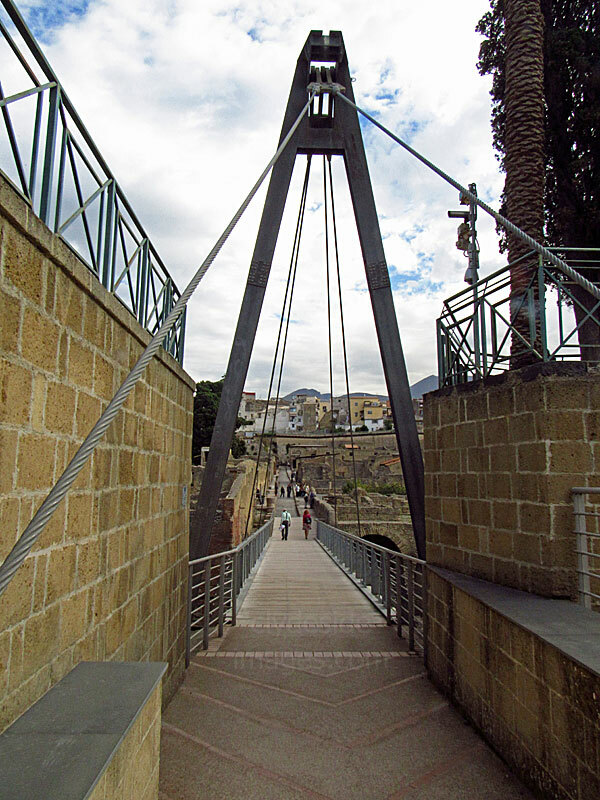 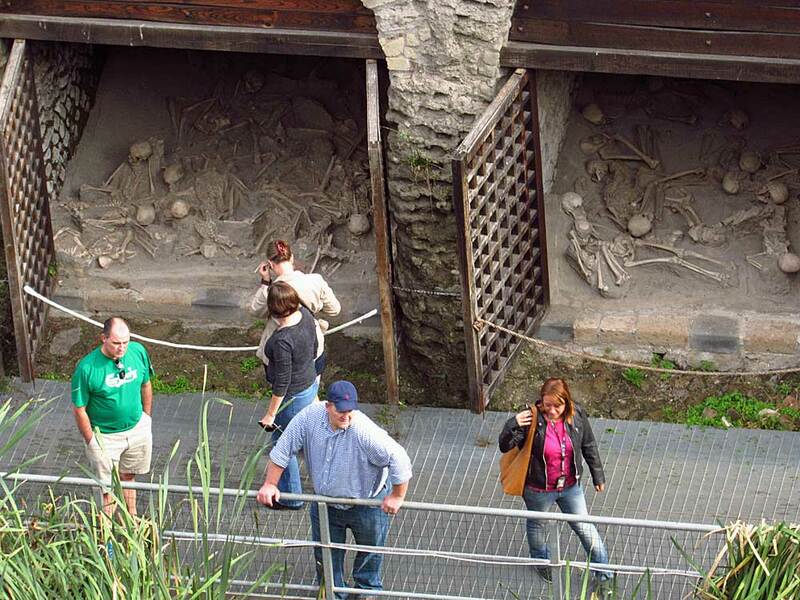 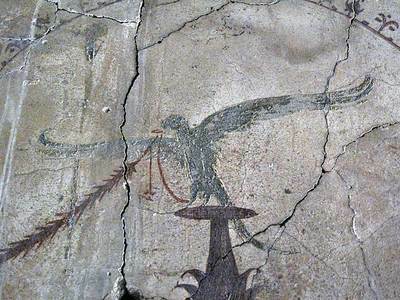 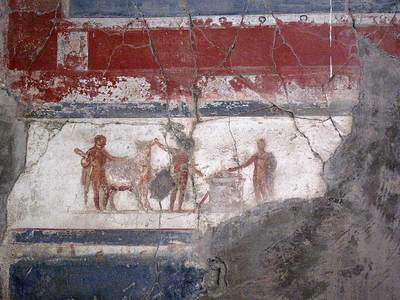 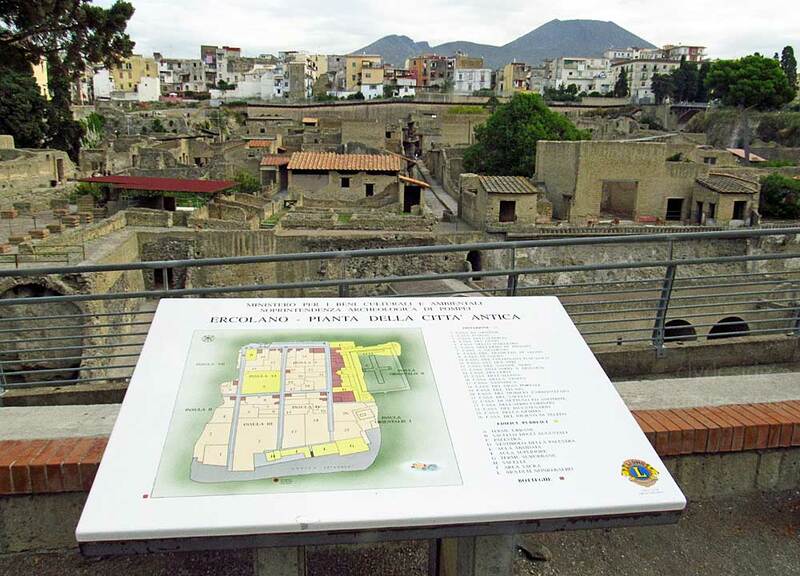 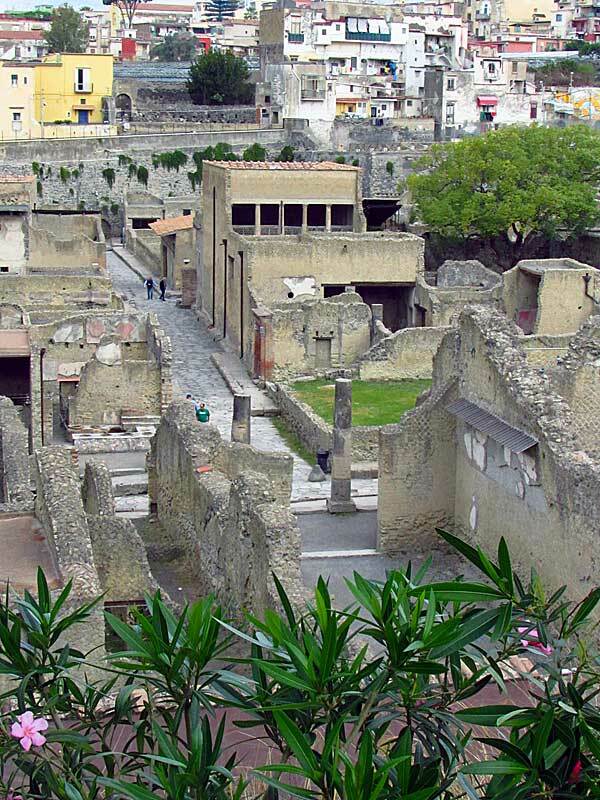 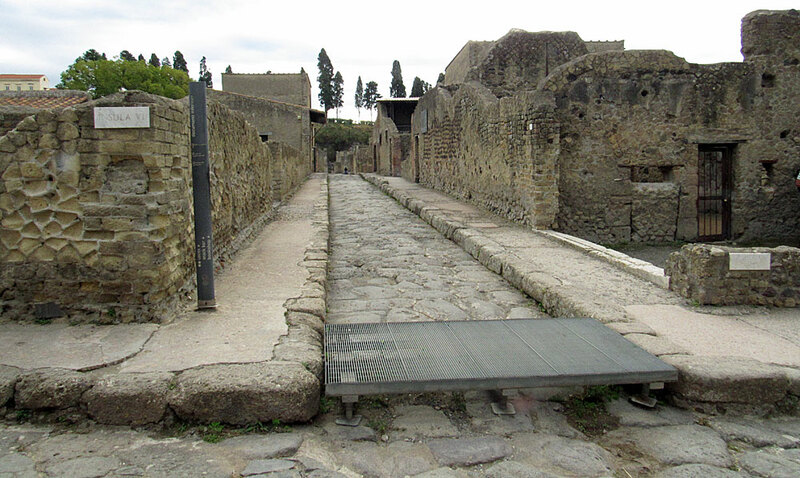 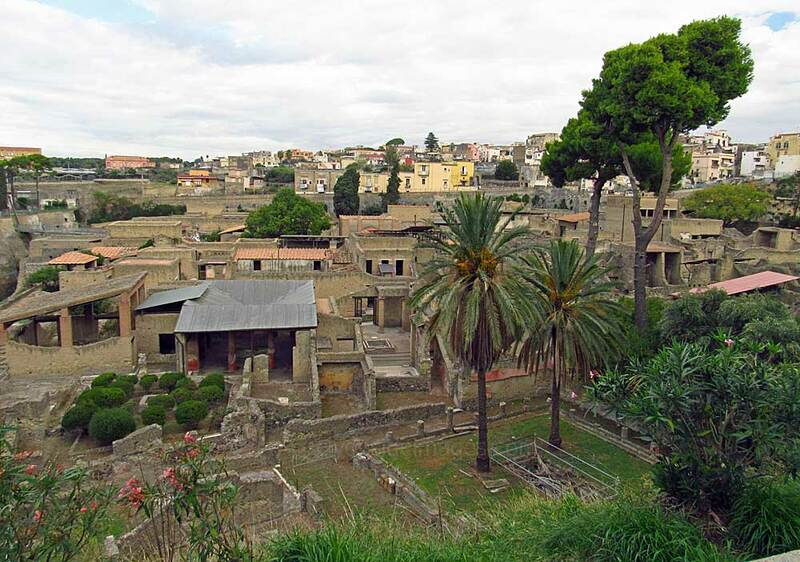 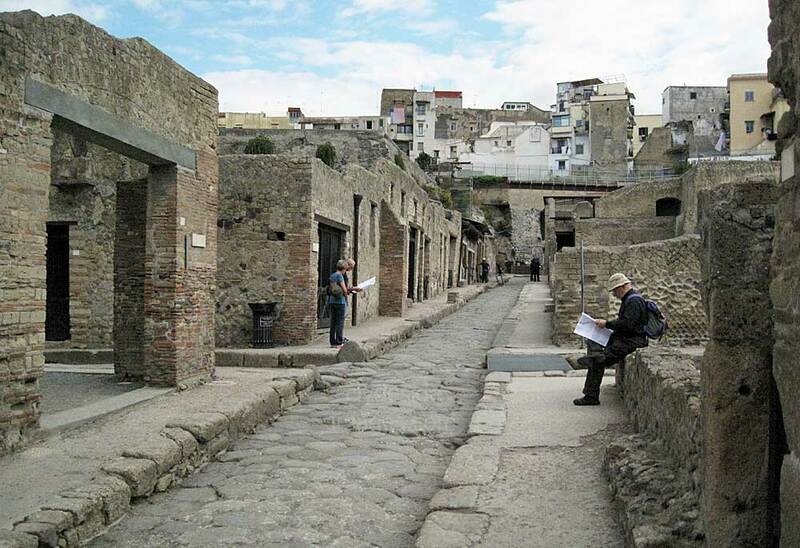 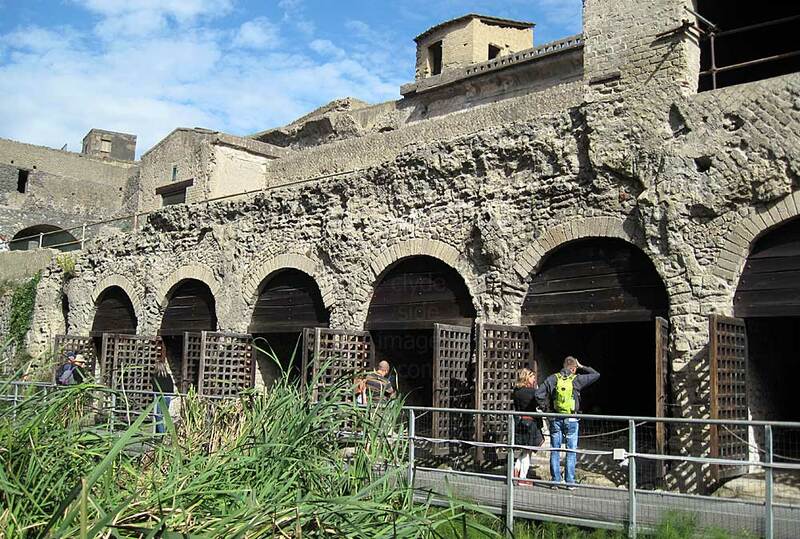 Although Herculaneum is upstaged by its larger rival Pompeii, the former archaeological site is often rated more favourably by those who have visited both. 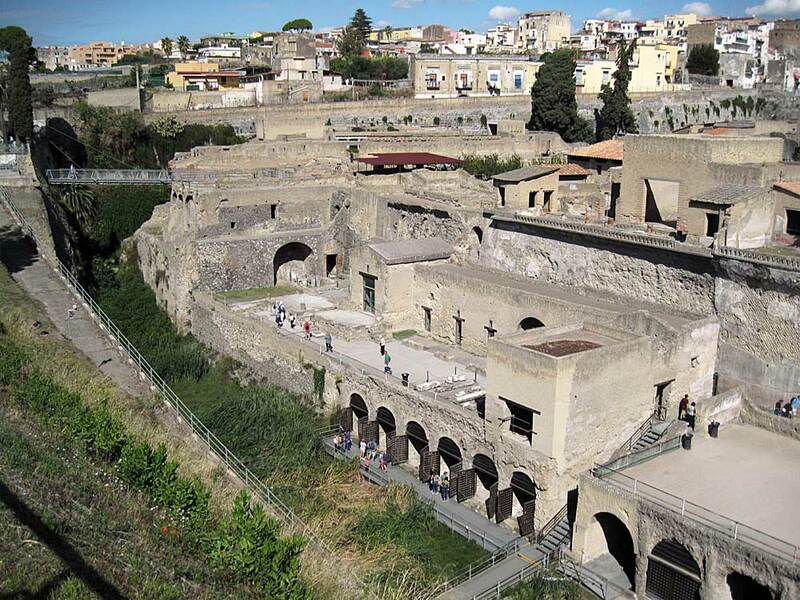 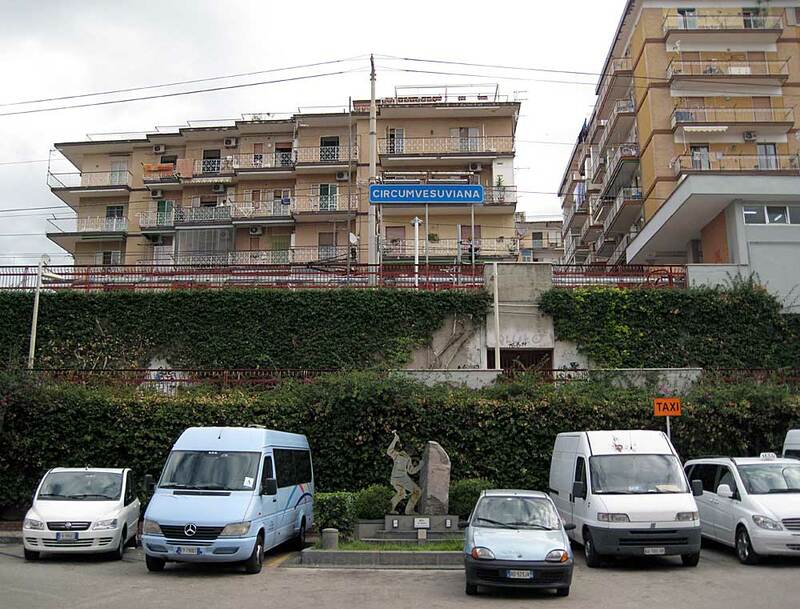 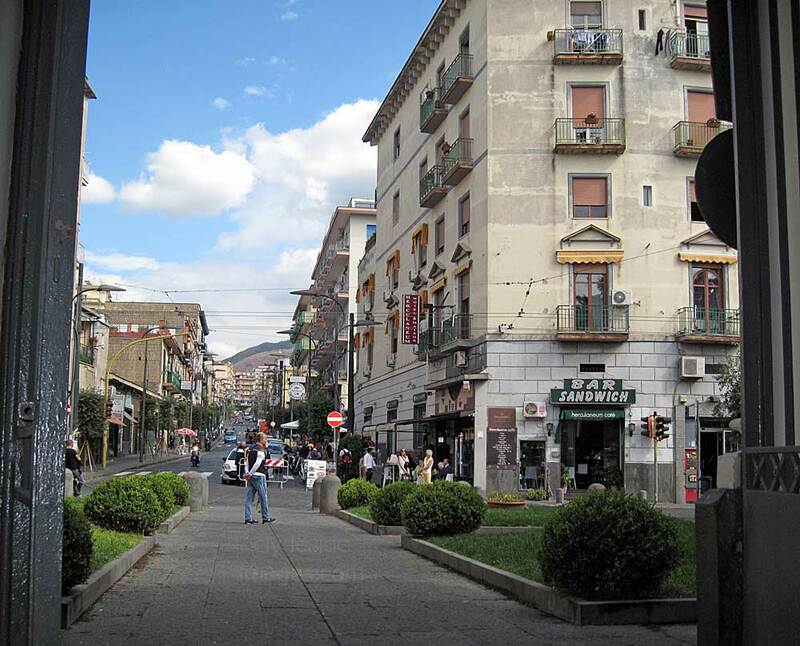 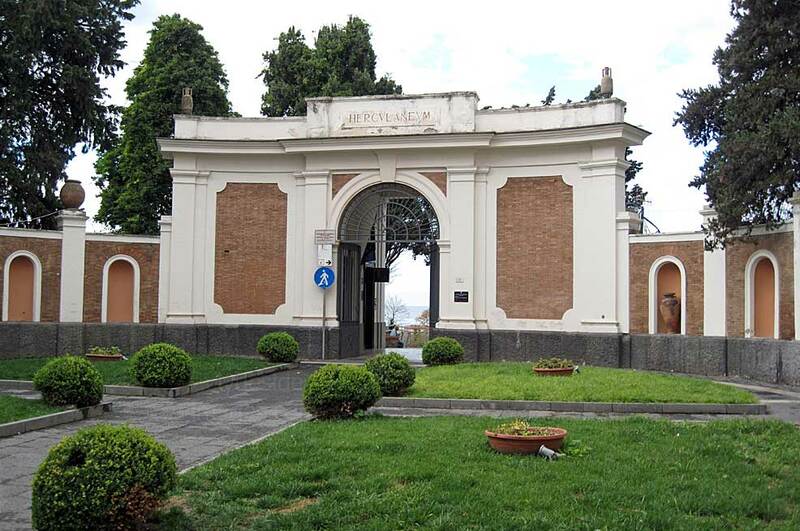 It takes about an hour to reach Herculaneum (Ercolano-Scavi) Station by train from Sorrento as opposed to just 30 minutes for Pompeii, and there is a slightly longer walk to reach the entrance, but Herculaneum is more compact and usually much quieter making it more enjoyable to explore. 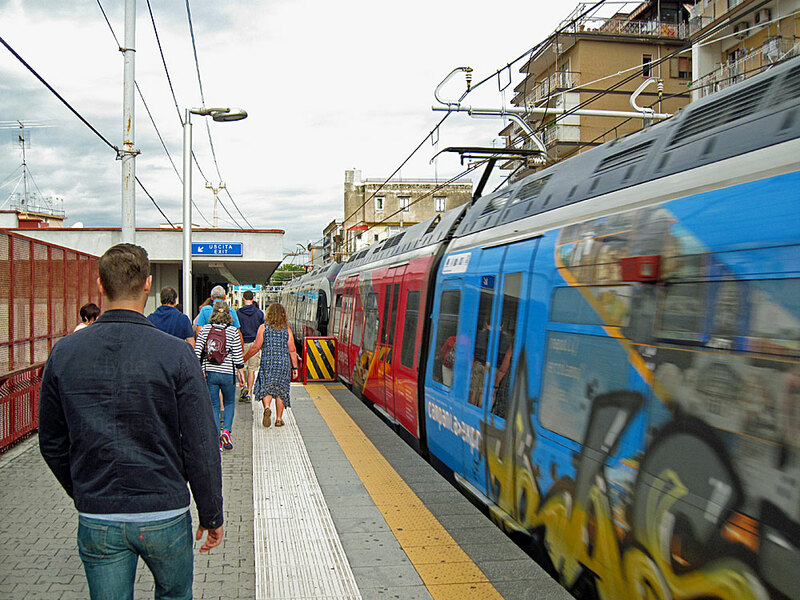 The trains on the Sorrento-Naples line are normally very busy, even outwith peak times so be prepared to stand all the way. 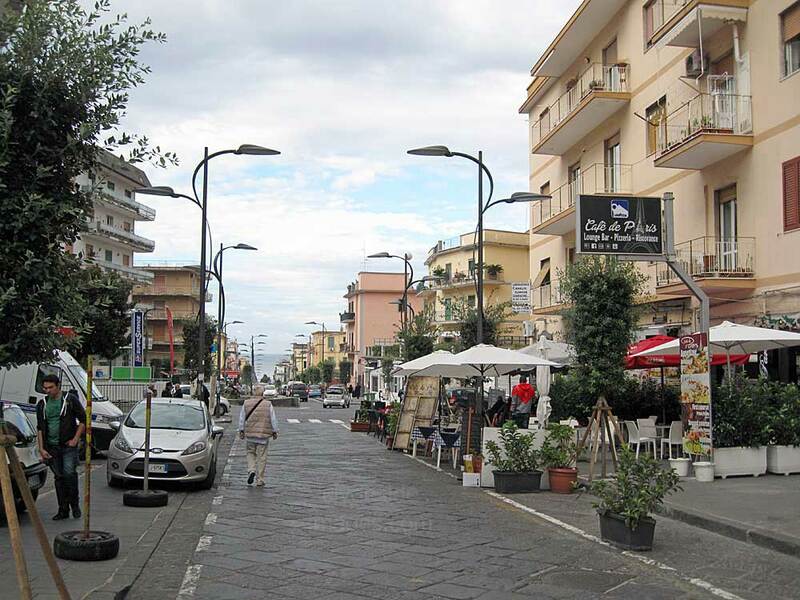 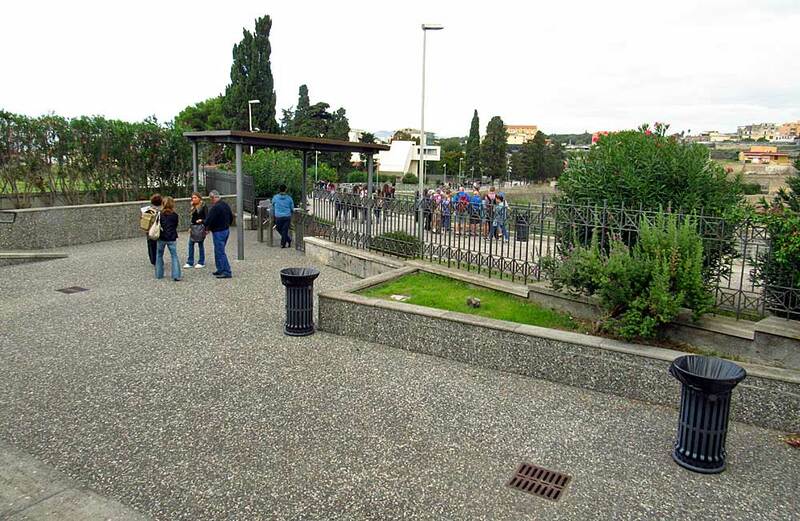 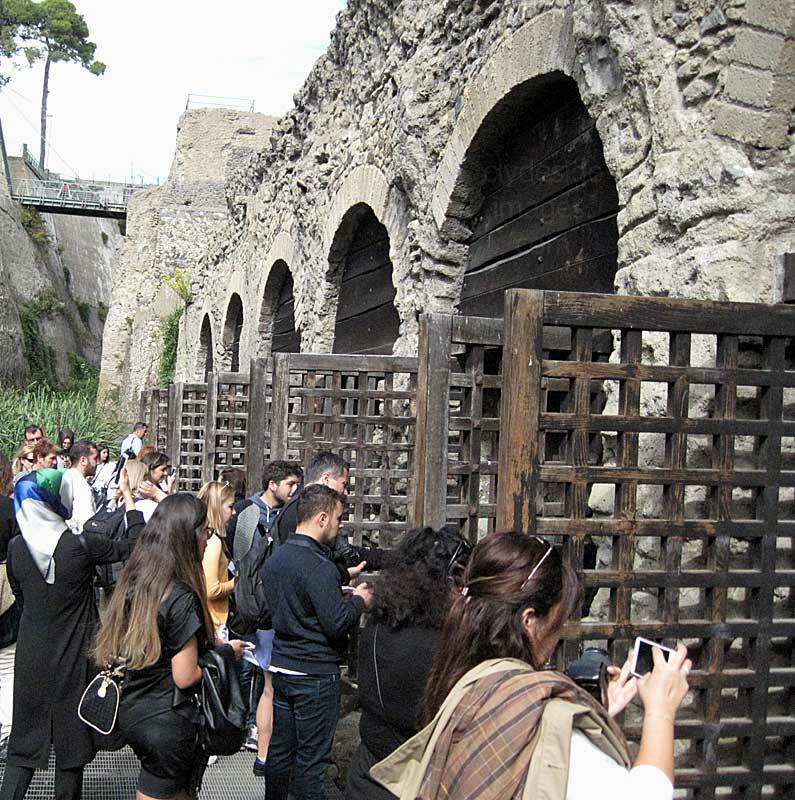 On exiting Ercolano-Scavi, tour operators have reps outside offering bus trips to the top of Vesuvius for €10 Euros per person but to reach the actual rim of the crater visitors must continue on foot from the parking area, around a 15 minute walk. 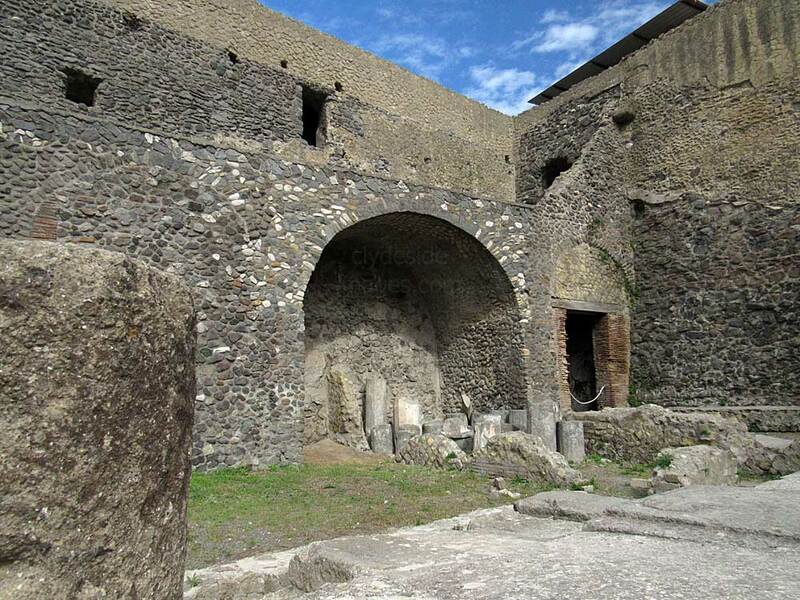 To get to the ruins from Ercolano train station walk downhill past the Archaeological Museum (unfortunately closed on Monday’s as I discovered) to the very end of Via IV Novembre from where a path leads through an archway (below) to the Herculaneum site`s information centre and ticket office. 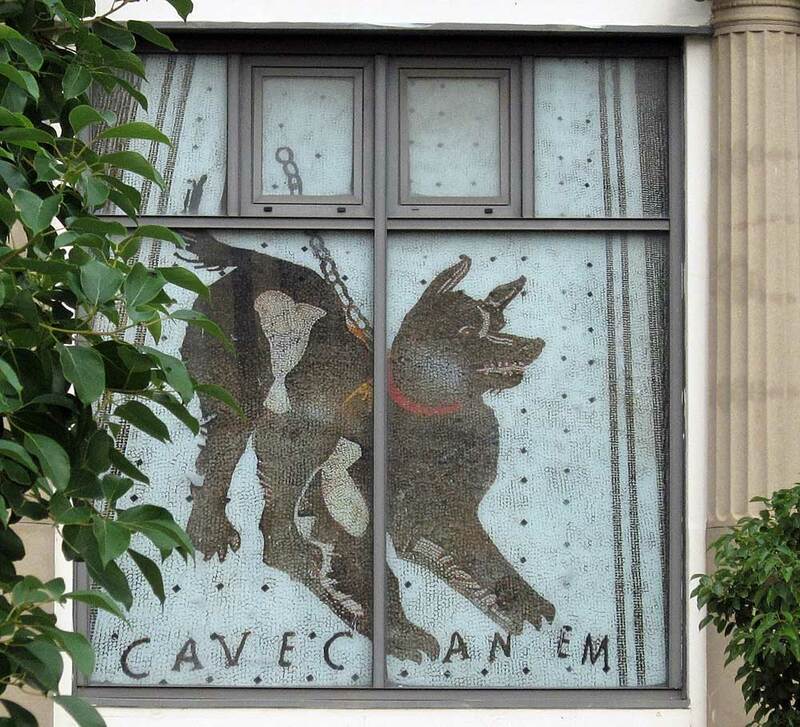 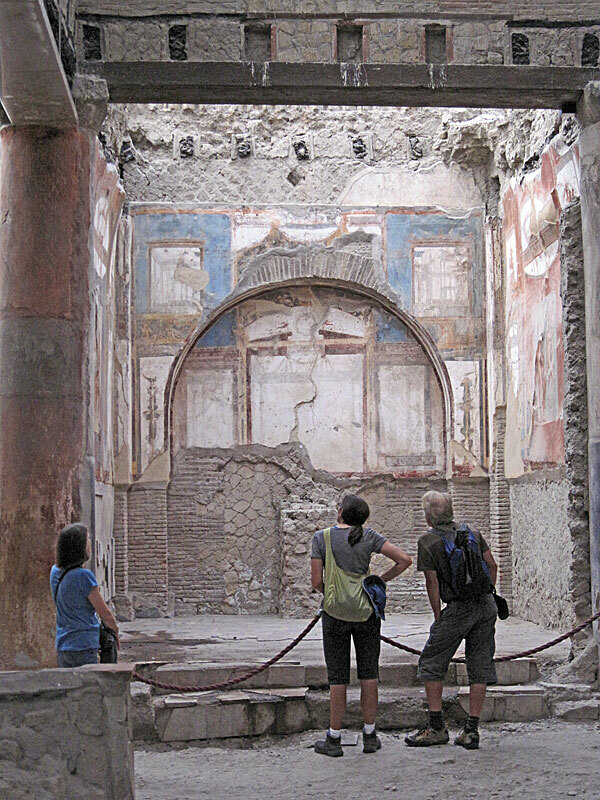 A widescreen cinema in the Archaeological Museum shows a film on the earthquake and catastrophic volcanic eruption, plus judging by the art work in the window, the Roman`s had their own version of Scooby Doo cartoons! 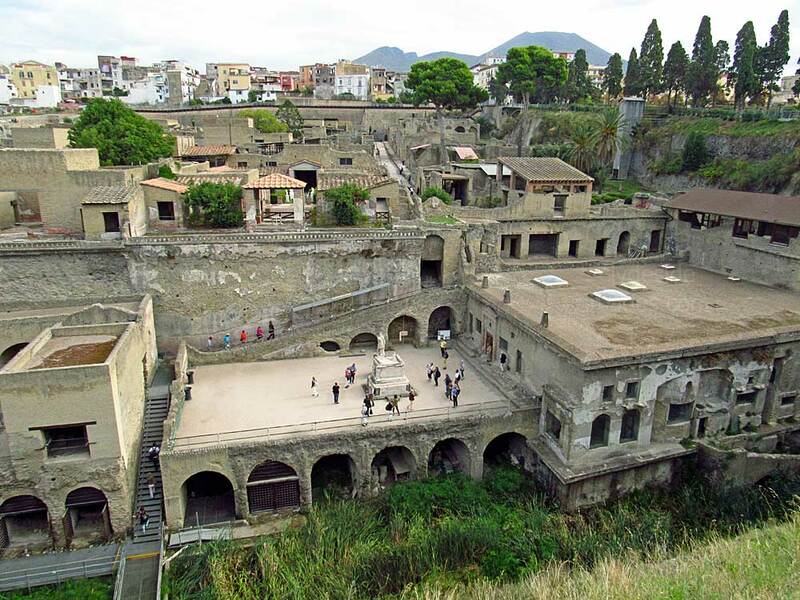 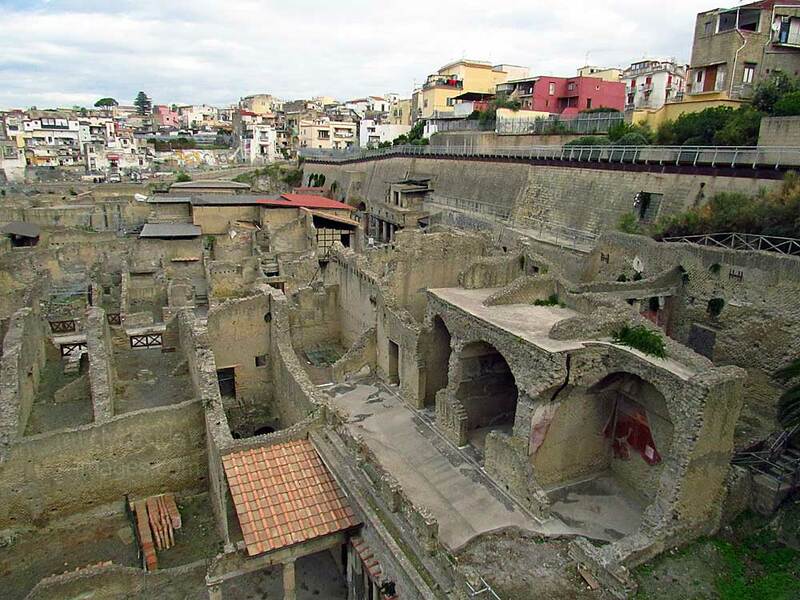 Herculaneum, which grew to become a Roman fishing town of 4,000 inhabitants, was founded at the end of the 6th century BC. 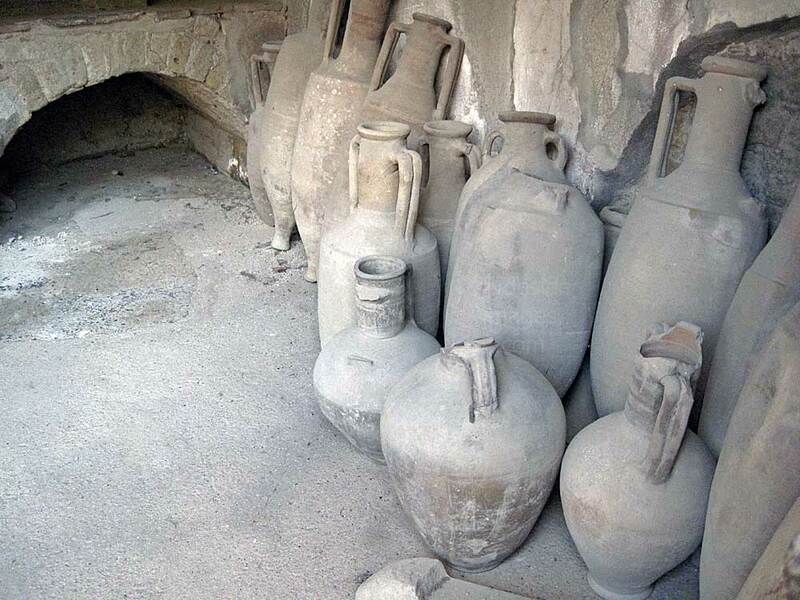 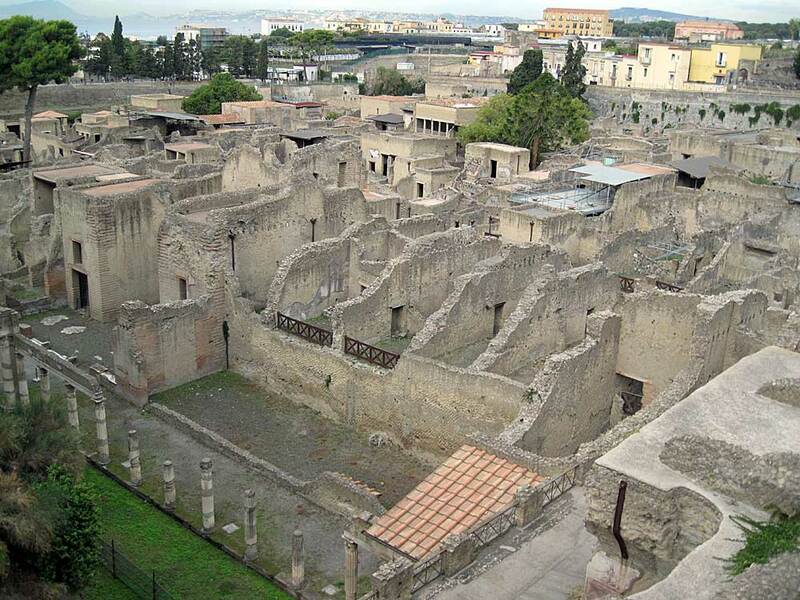 The settlement`s fate runs parallel to that of Pompeii. 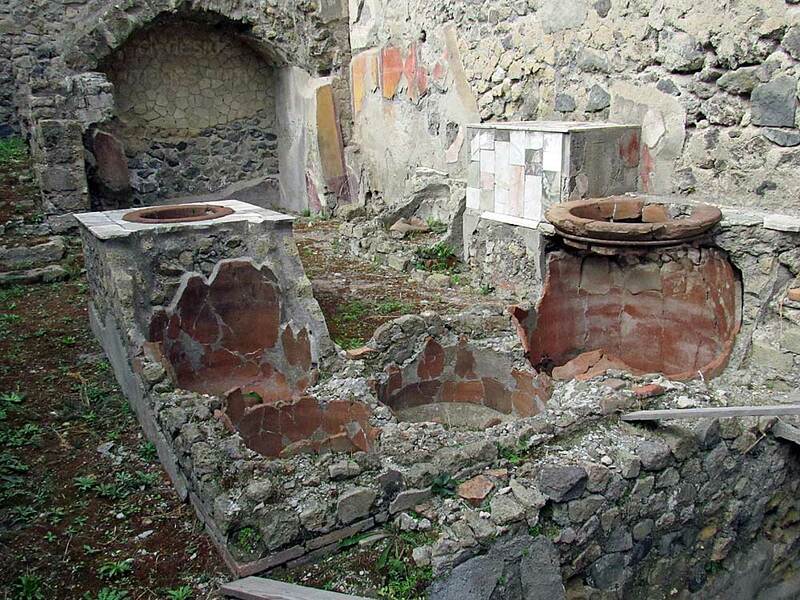 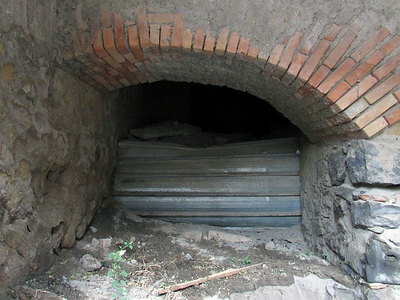 Destroyed by an earthquake in AD 62, the AD 79 eruption of Mt Vesuvius saw it submerged in a 16 metre-thick sea of mud that essentially fossilised the city. This meant that even delicate items, such as furniture and clothing, were found to be in a remarkable state of preservation. 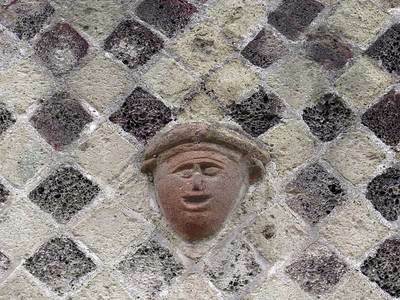 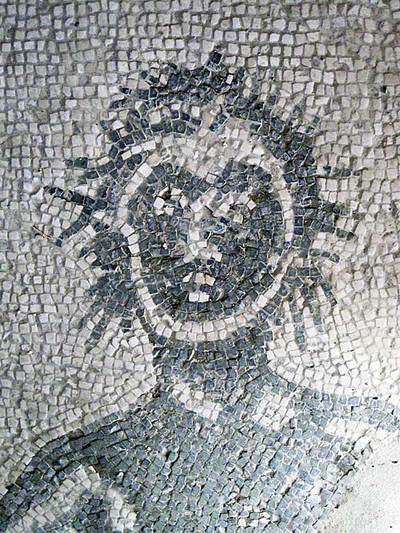 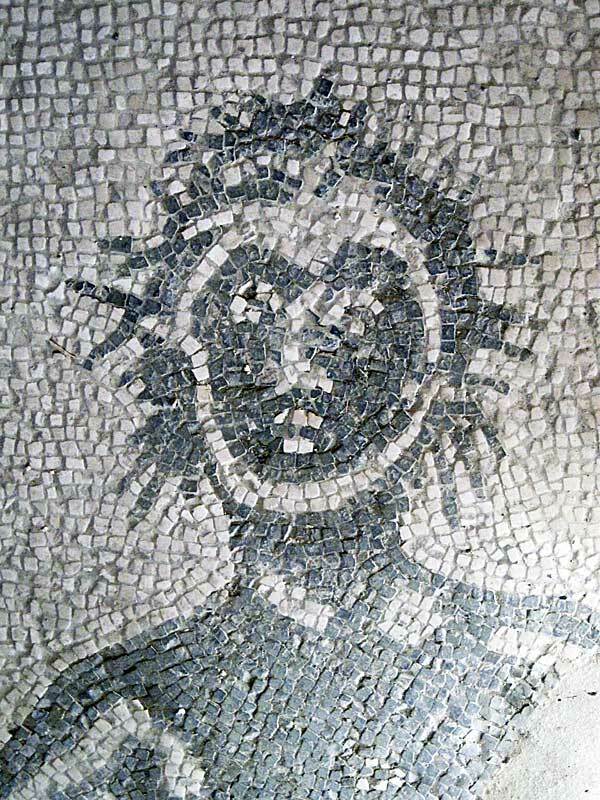 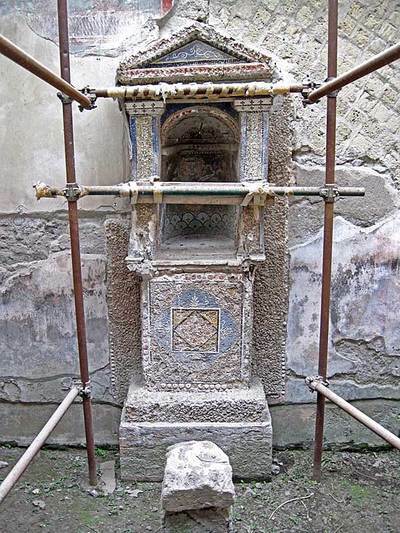 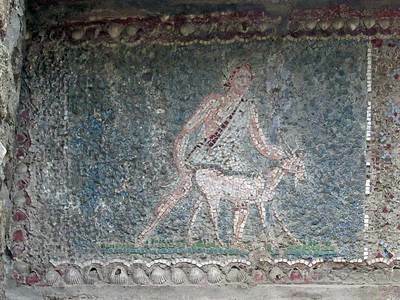 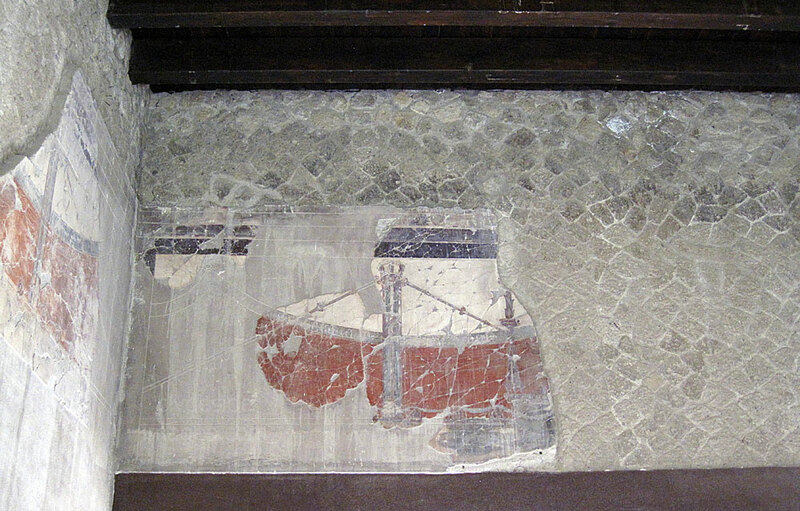 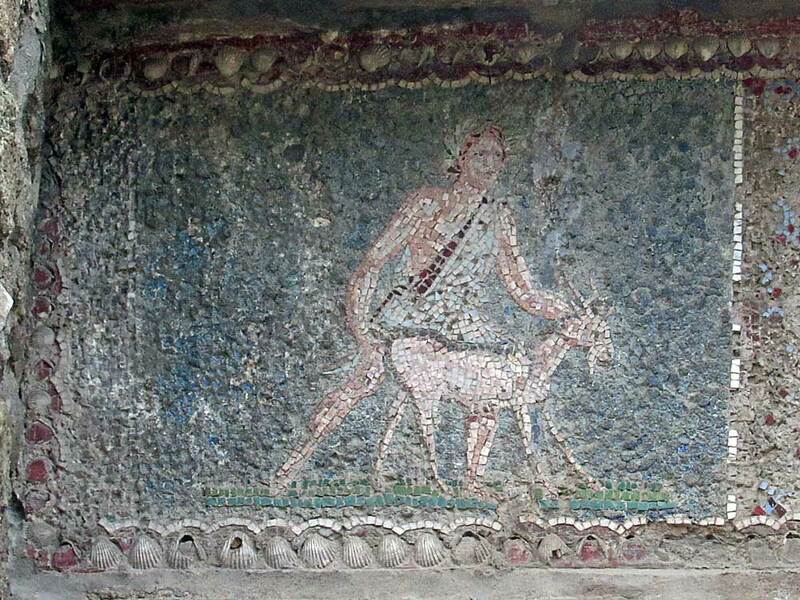 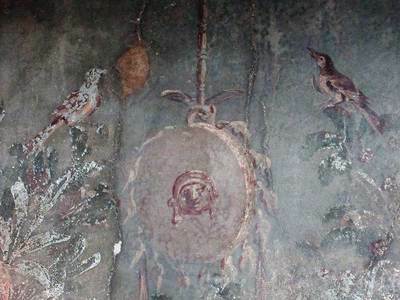 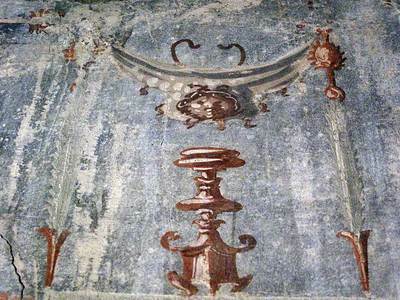 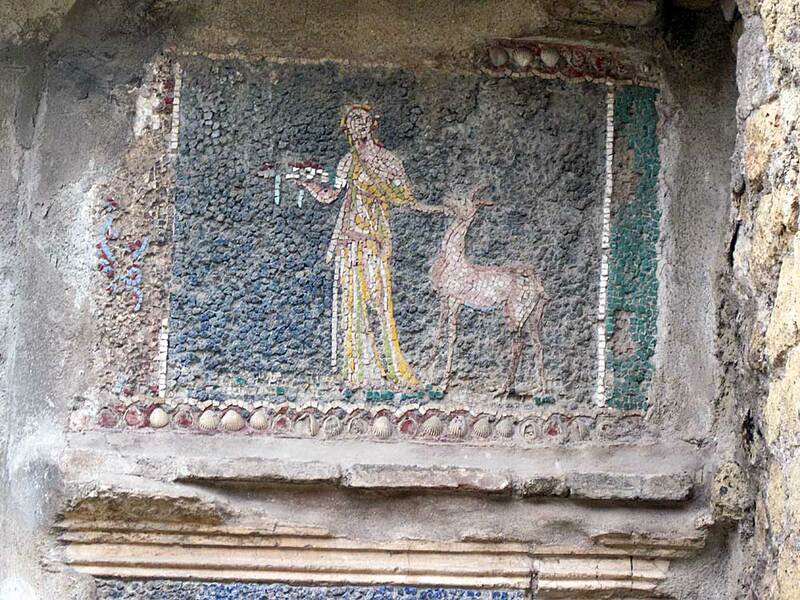 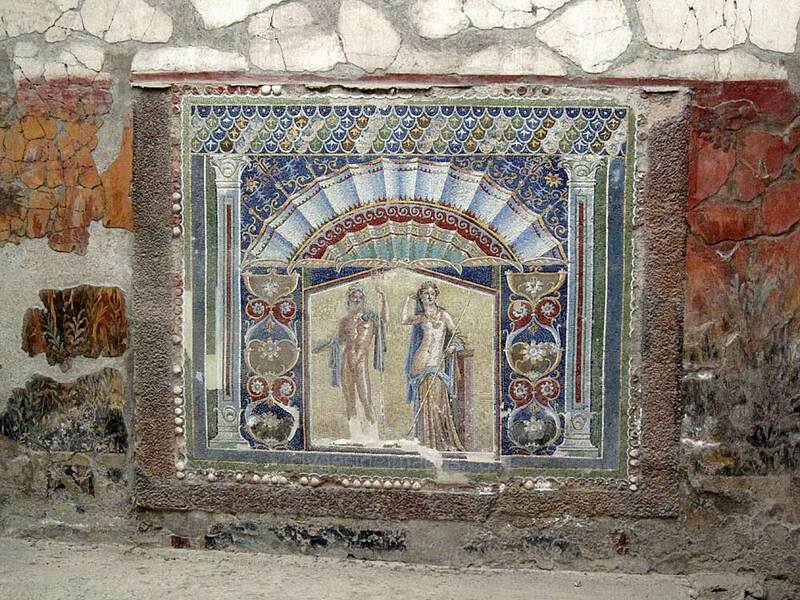 Many murals and mosaics can still be seen, some of which are more or less intact. 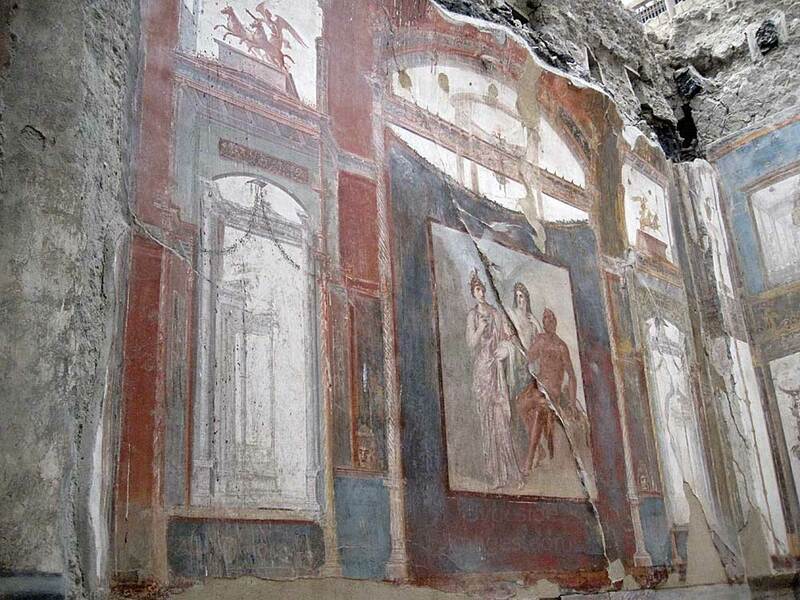 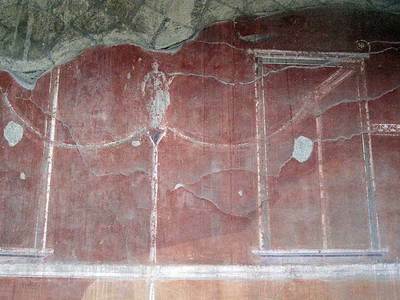 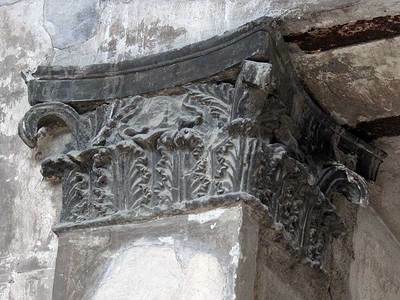 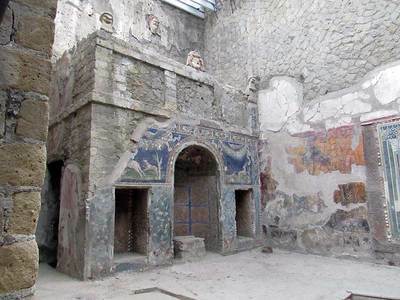 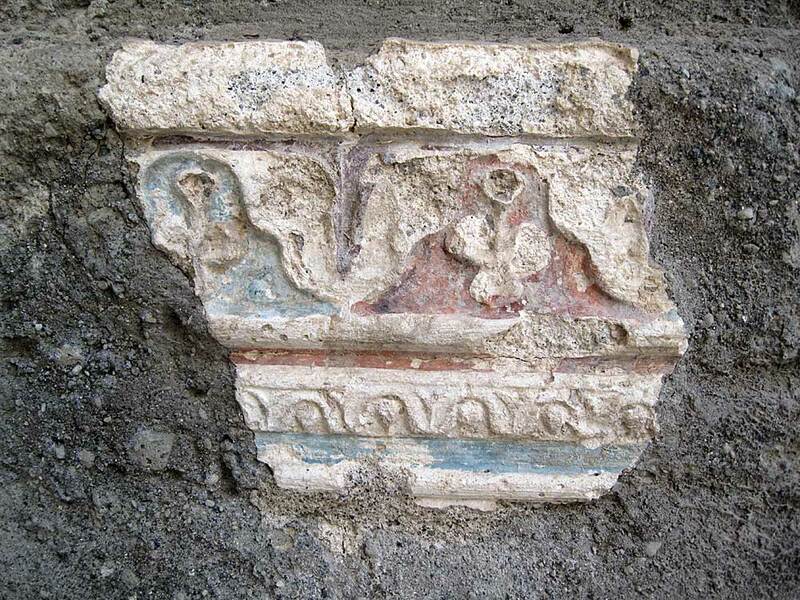 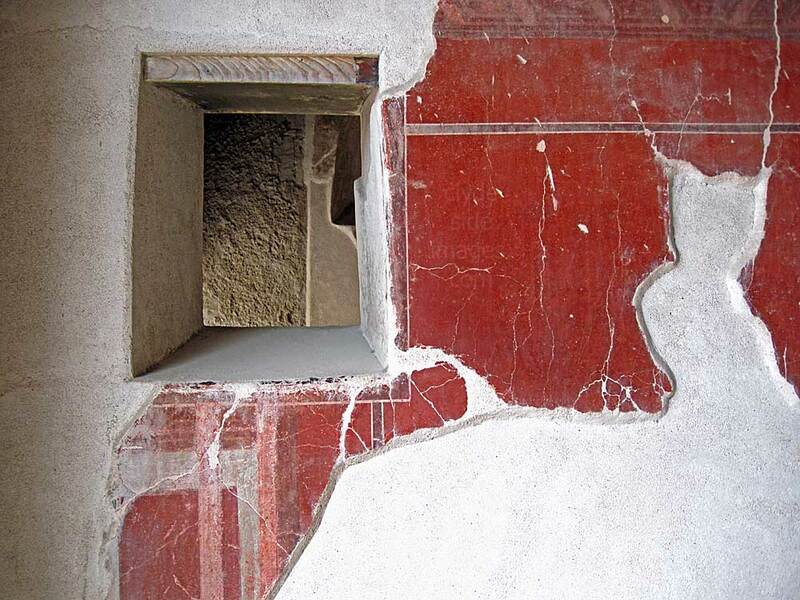 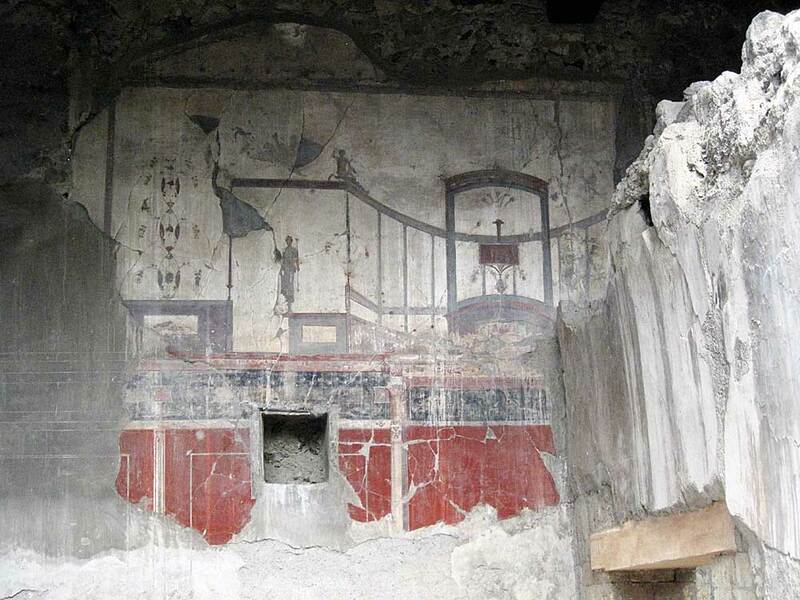 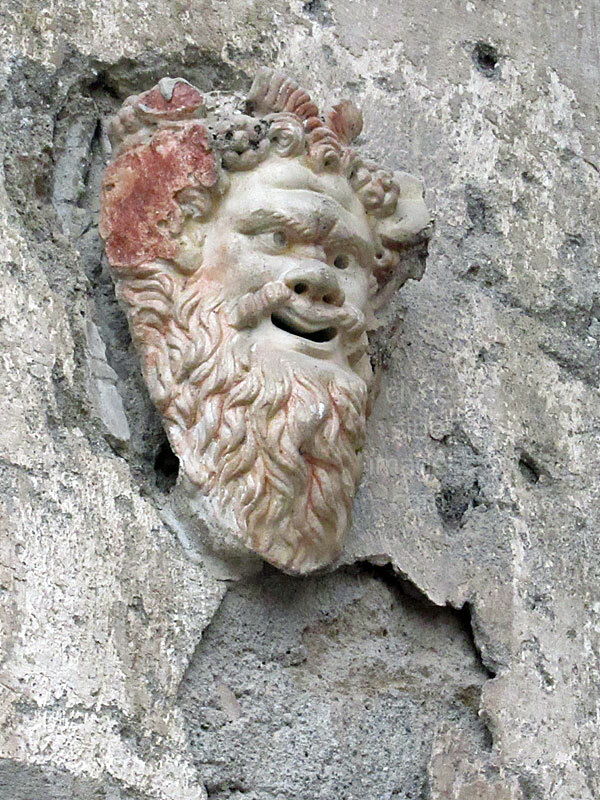 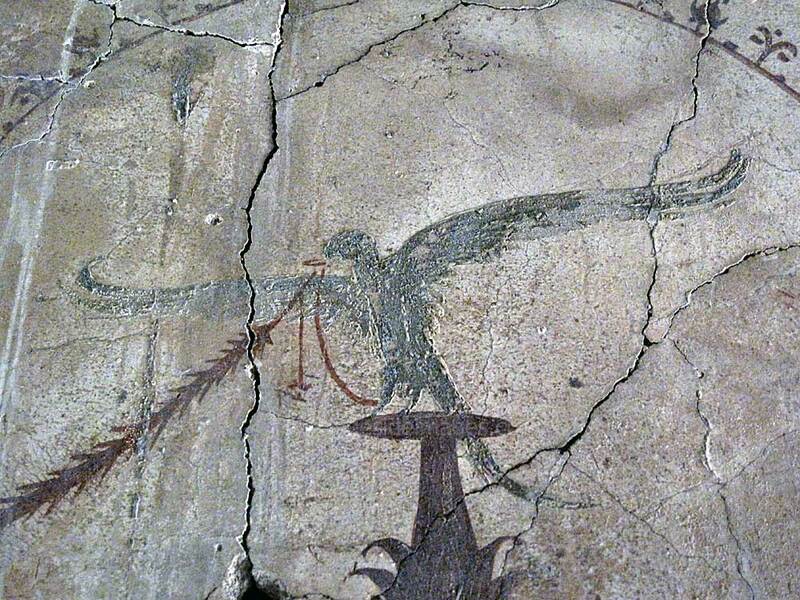 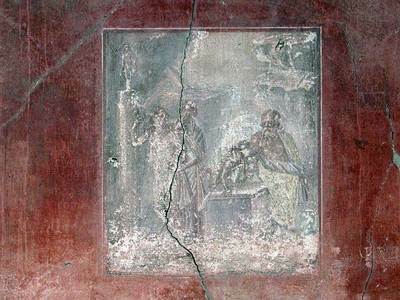 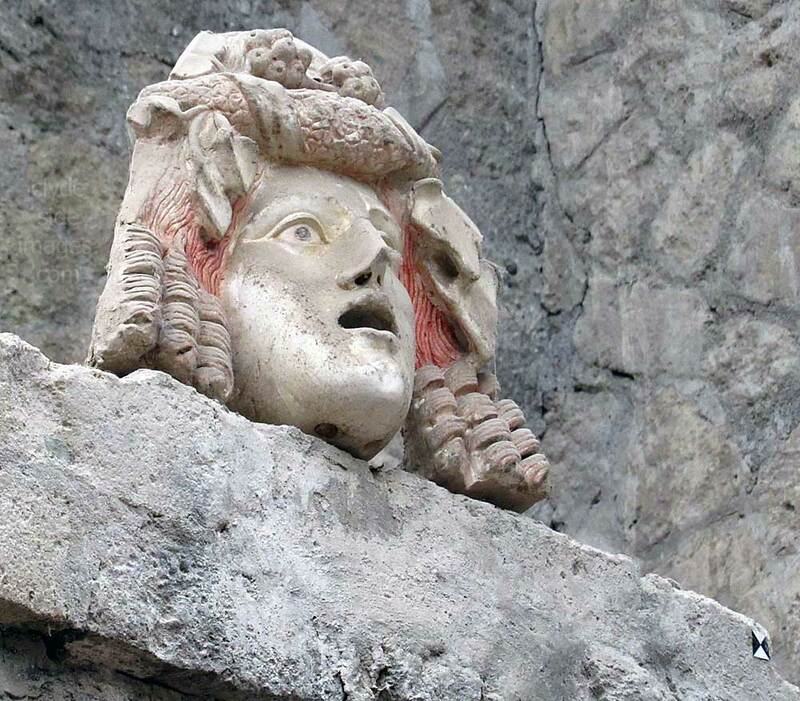 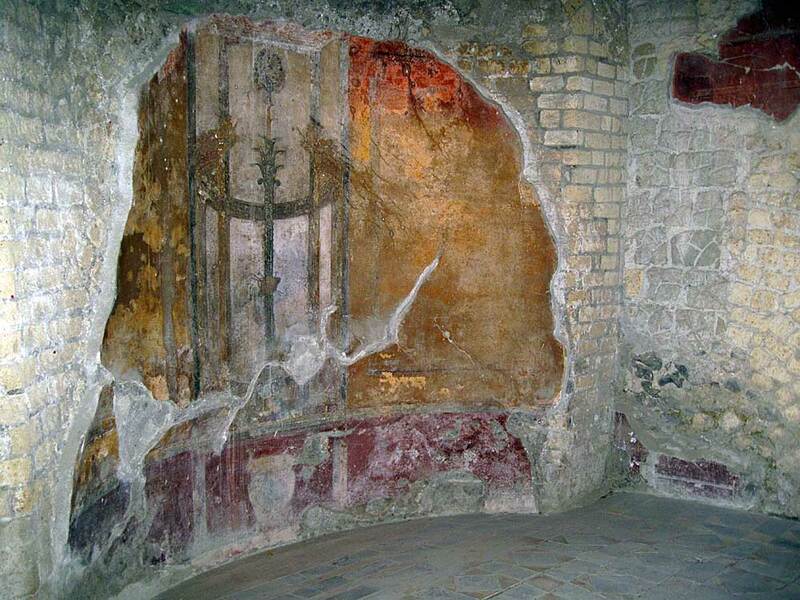 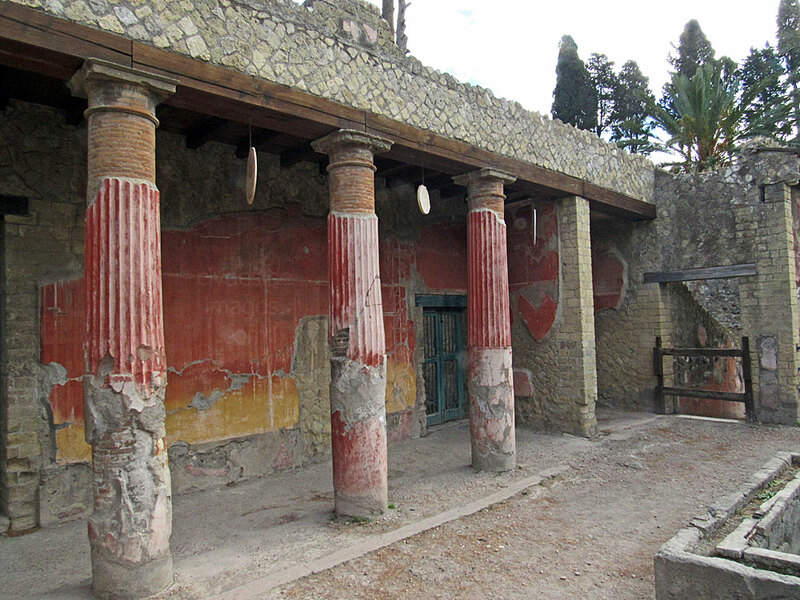 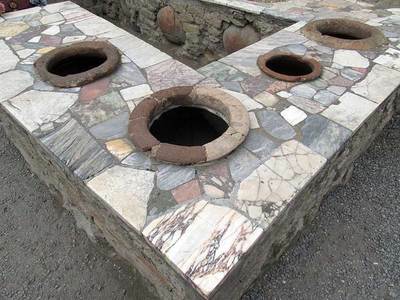 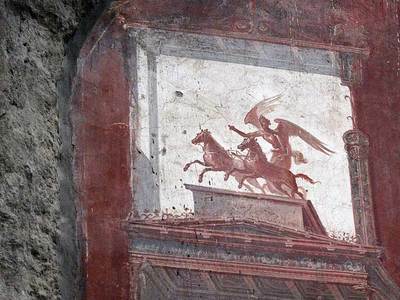 ​Herculaneum was a wealthier town than Pompeii, possessing an extraordinary density of fine houses with, for example, far more lavish use of coloured marble cladding. 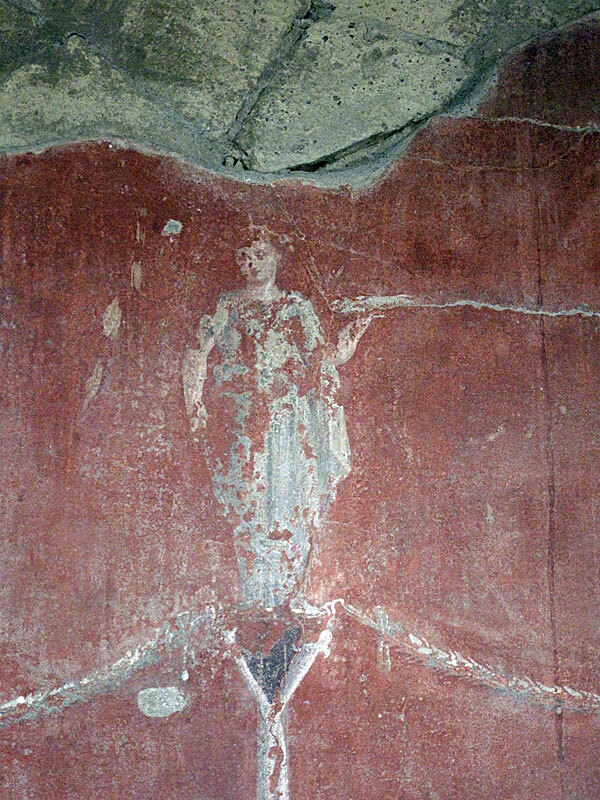 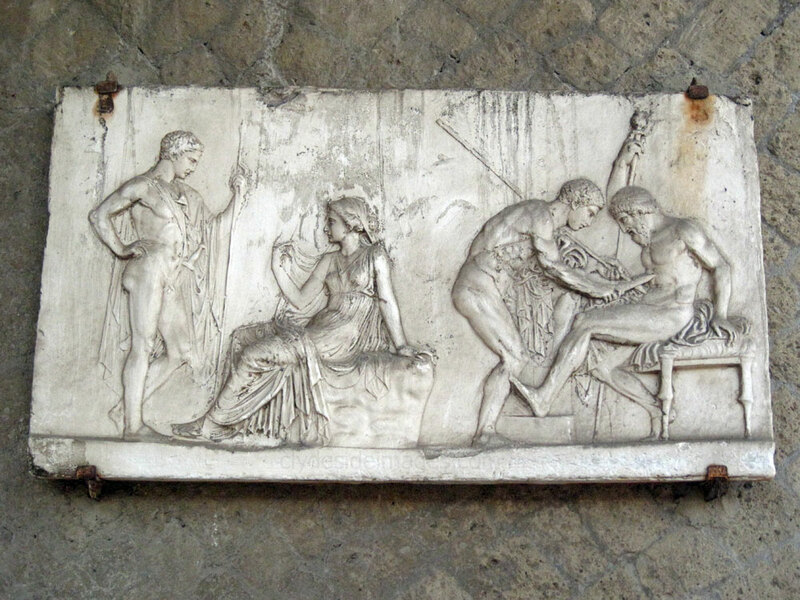 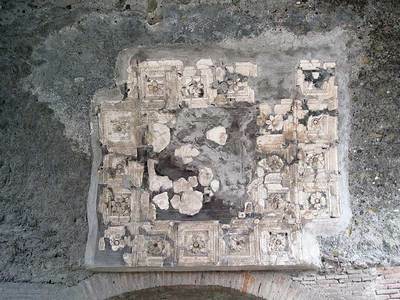 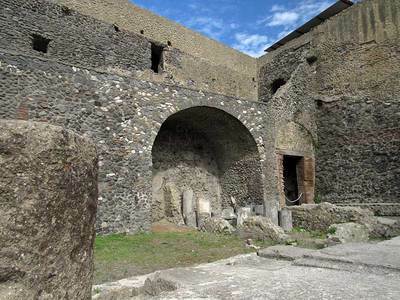 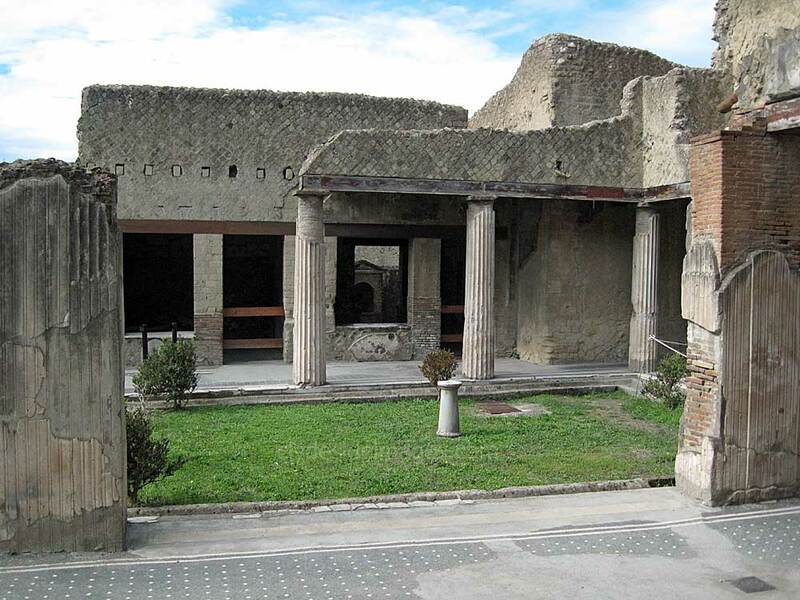 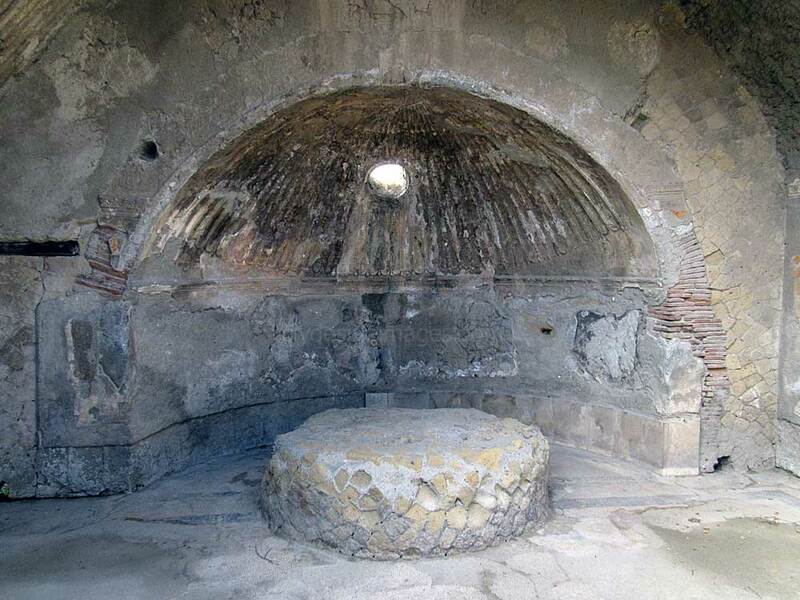 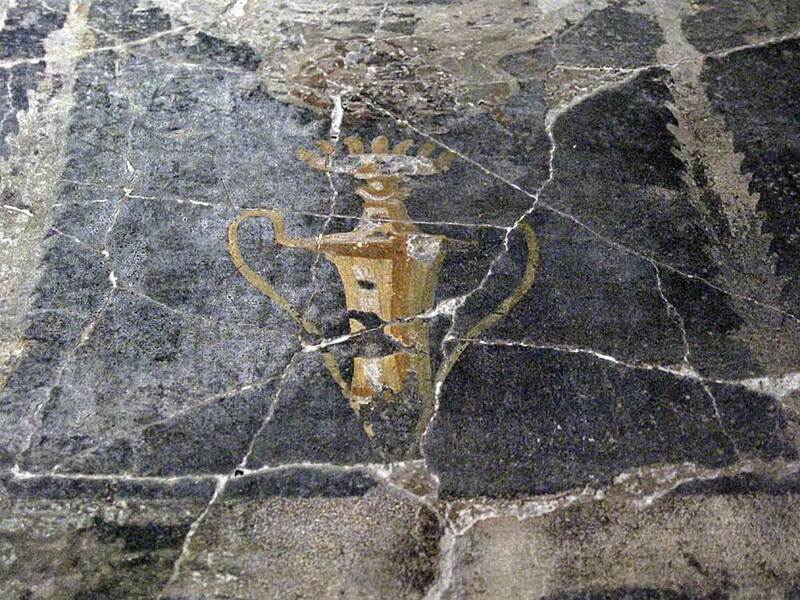 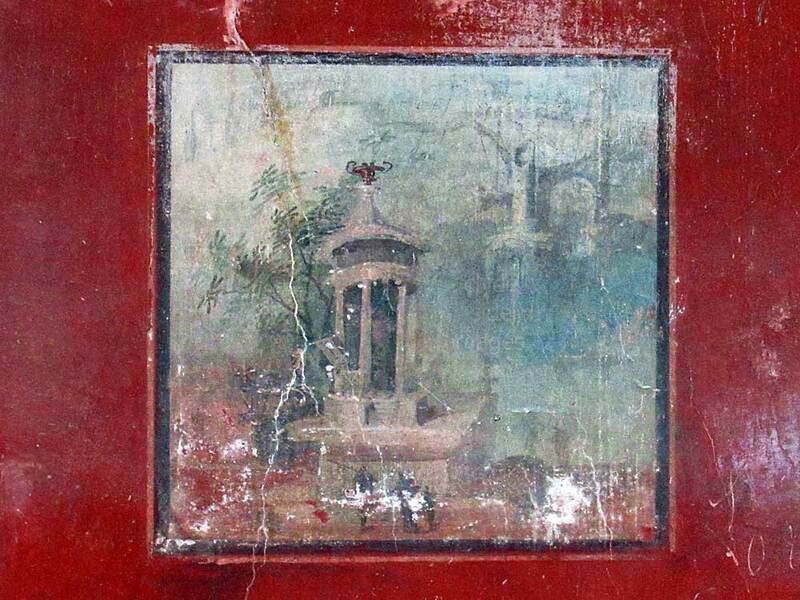 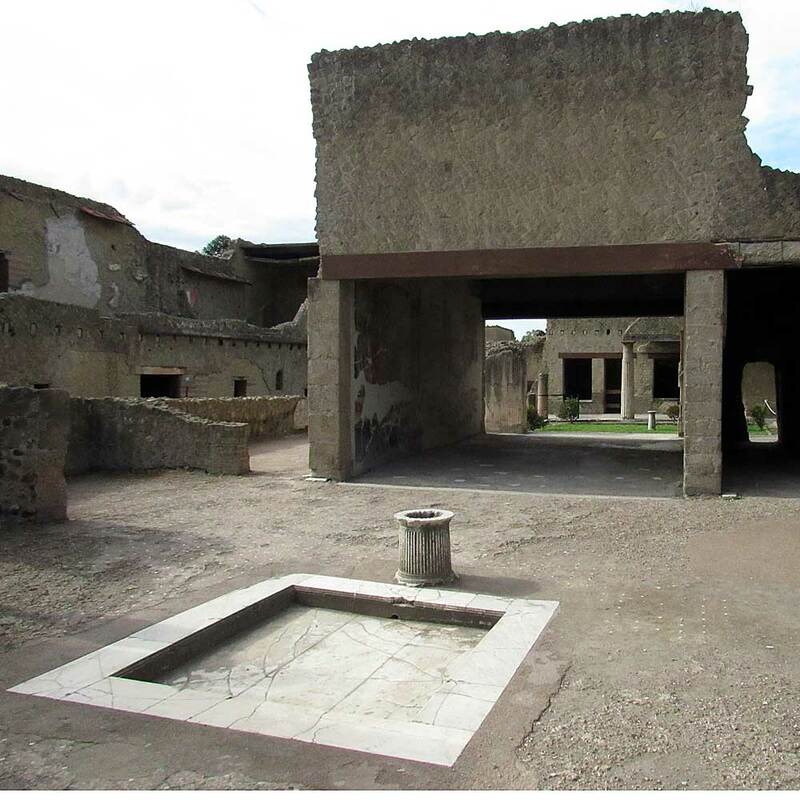 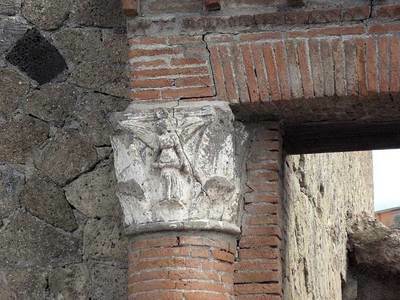 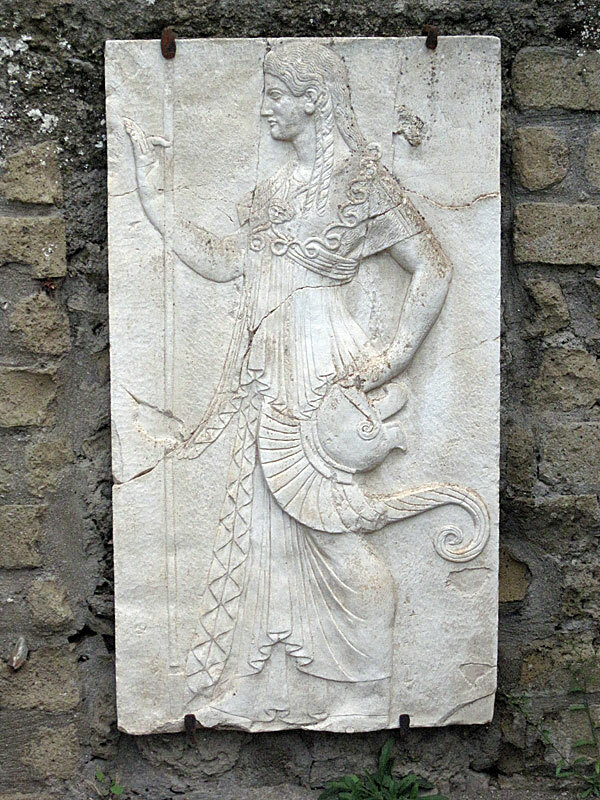 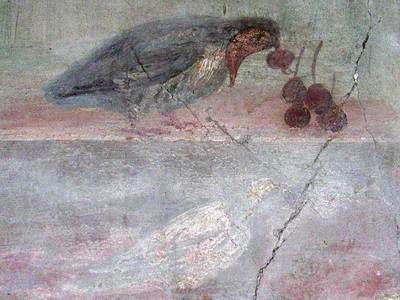 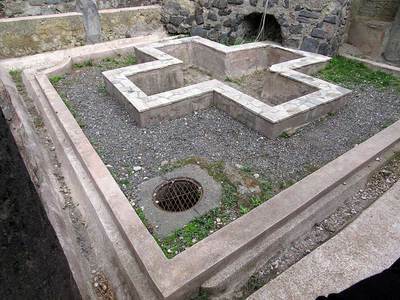 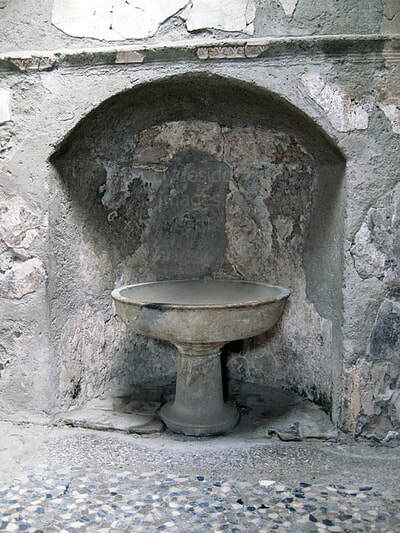 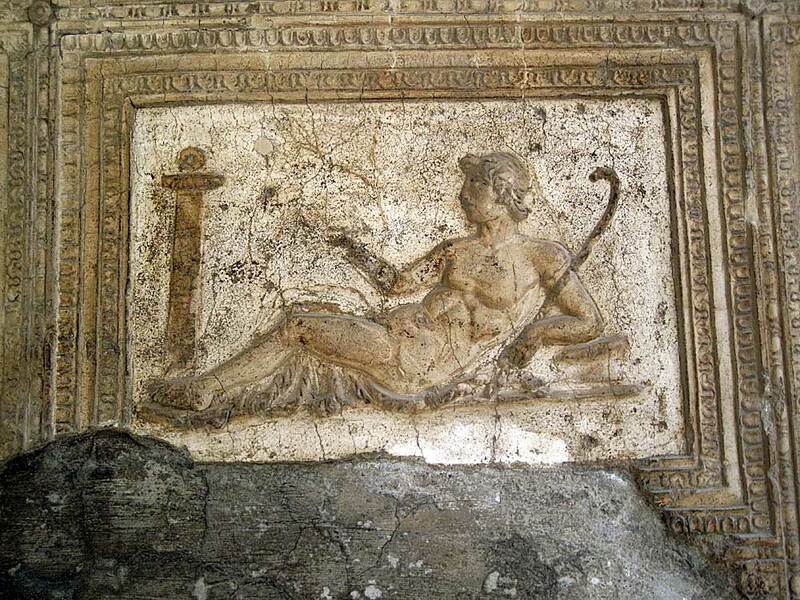 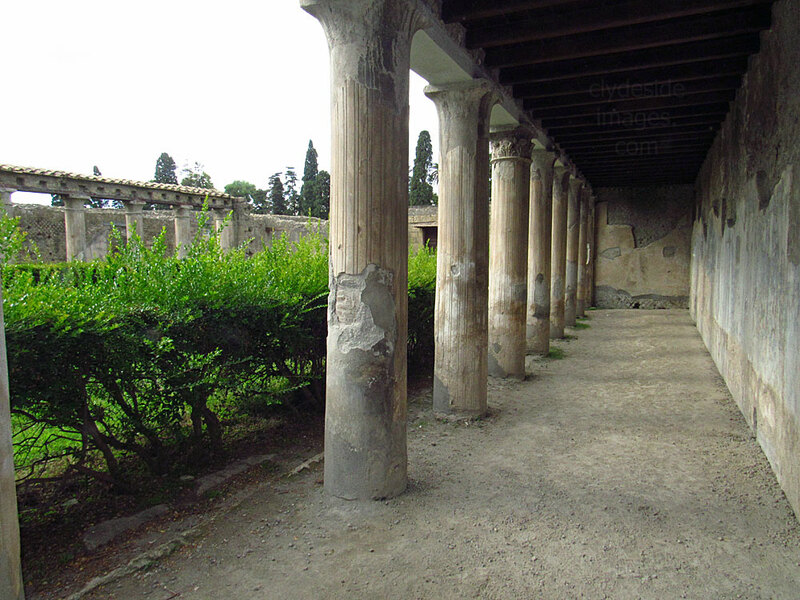 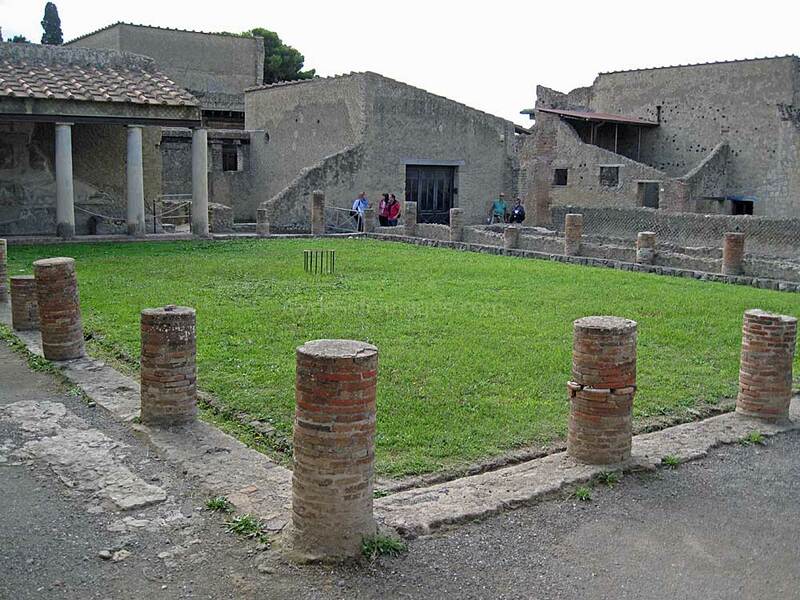 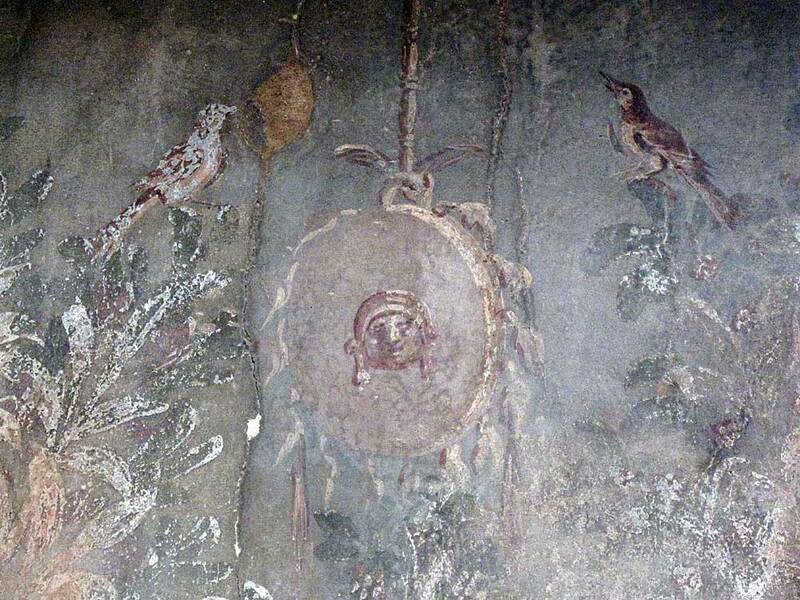 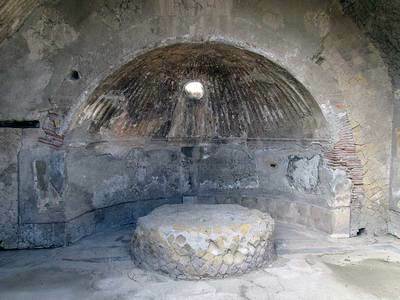 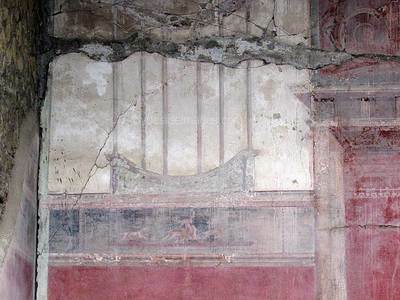 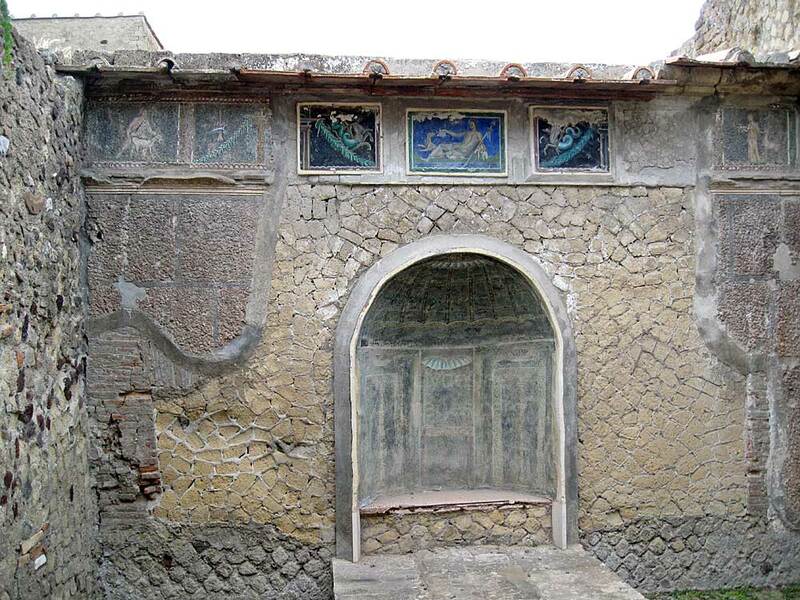 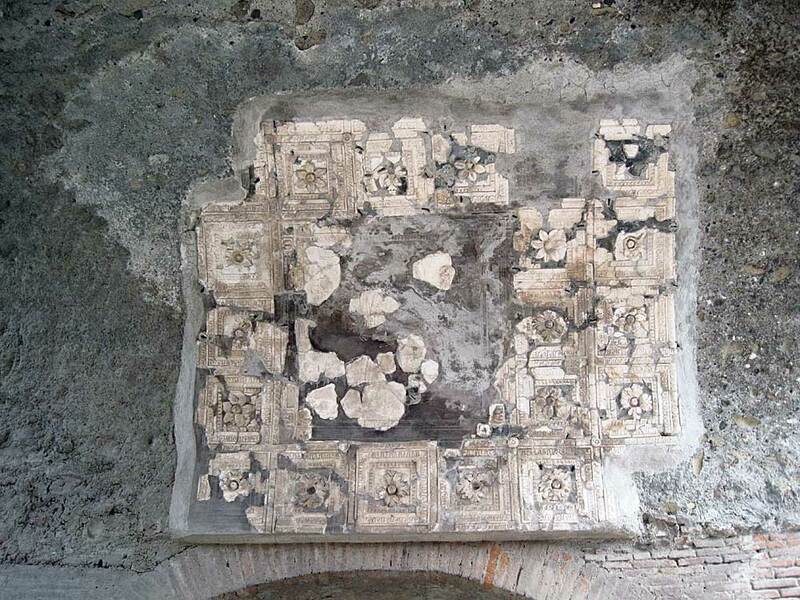 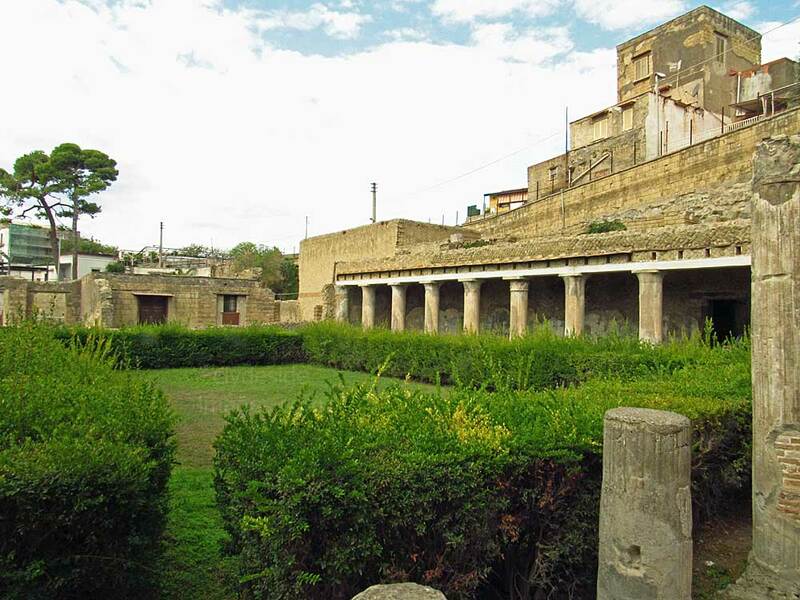 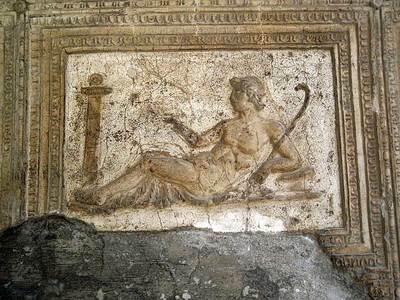 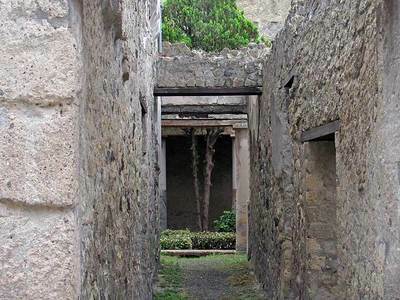 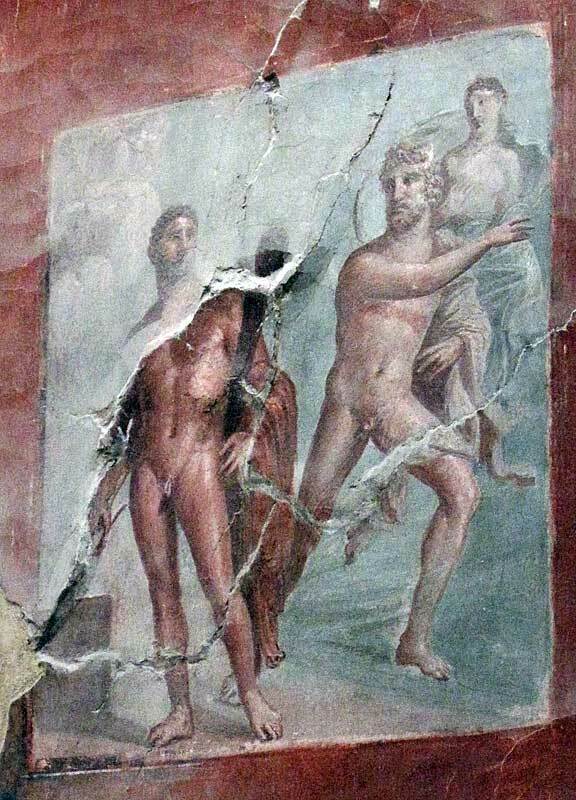 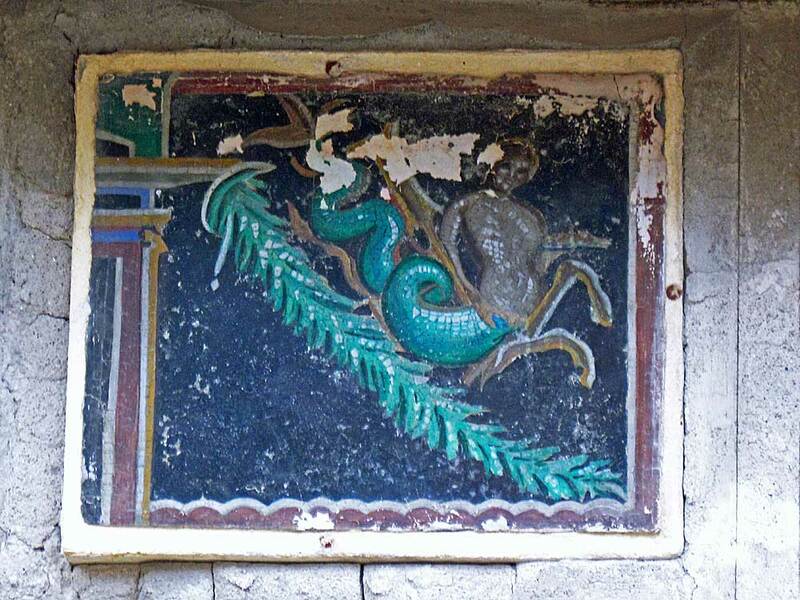 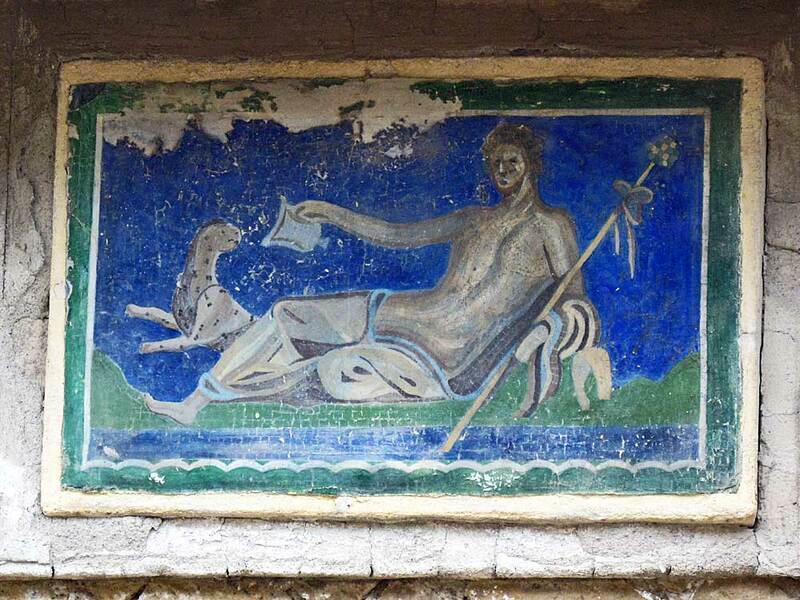 The most famous of the luxurious villas at Herculaneum is the `Villa of the Papyri` which was originally thought to have been the magnificent seafront retreat for Lucius Calpurnius Piso Caesoninus, Julius Caesar's father-in-law, however, later research has cast doubt on this assumption. 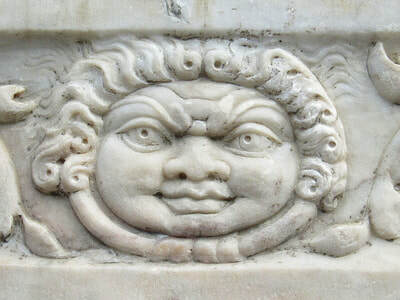 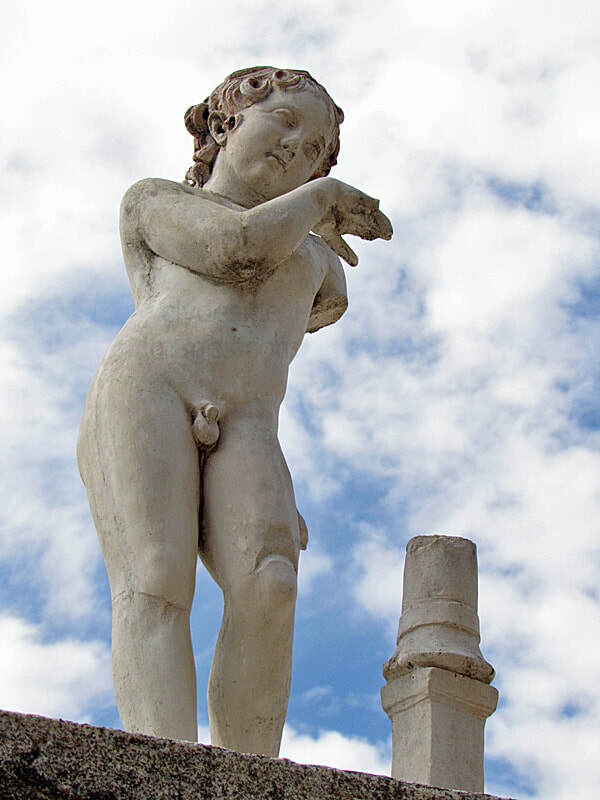 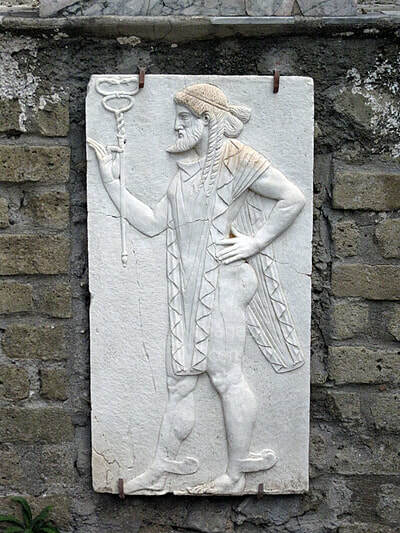 Some original statues can be found on site. 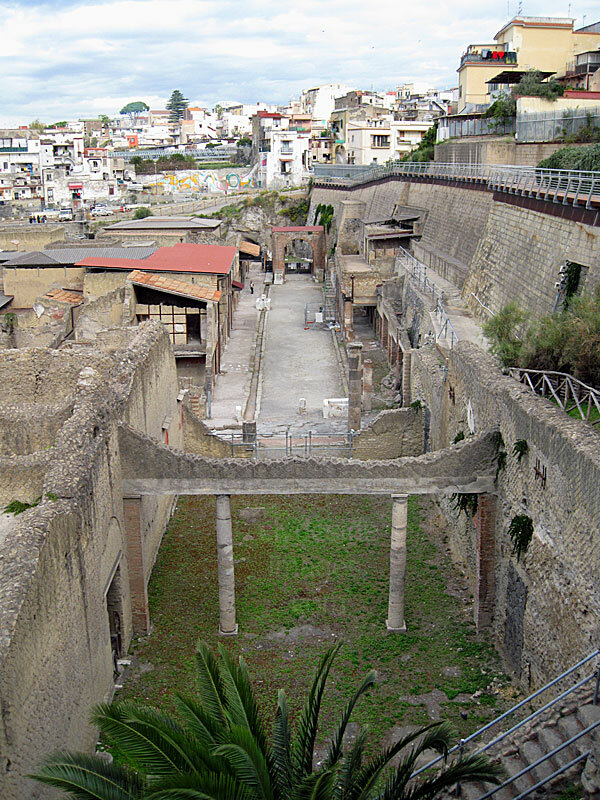 Many public and private buildings, including the forum complex, have still to be excavated. 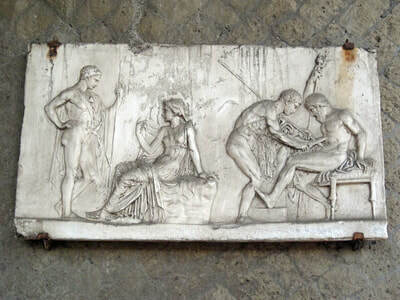 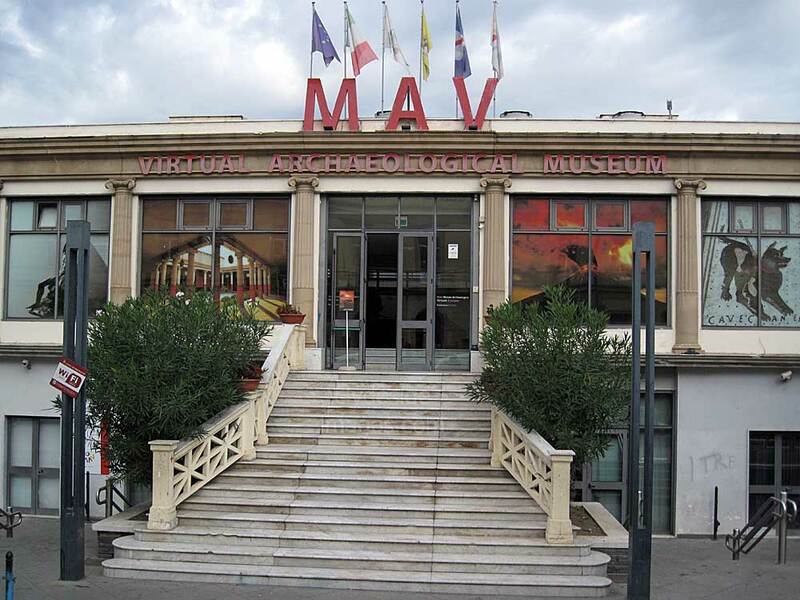 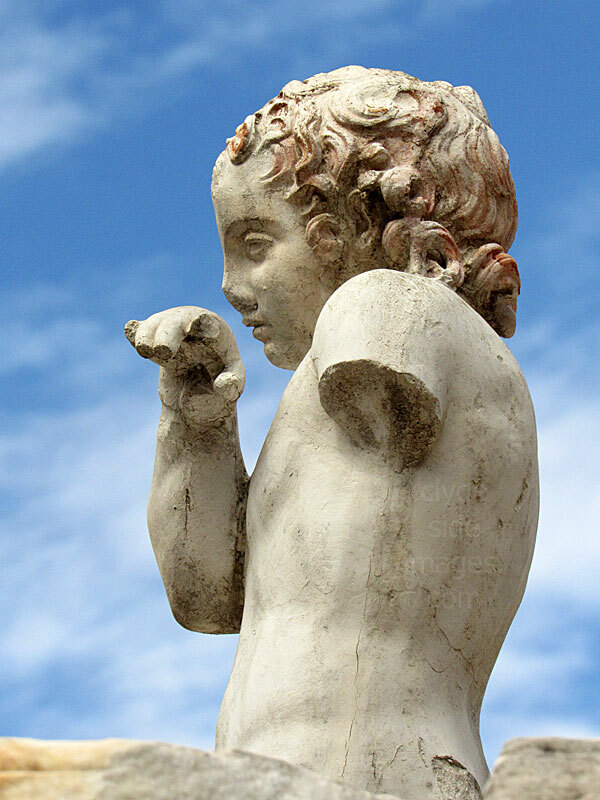 A large number of artifacts, including statuary, already recovered from Herculaneum are preserved in the Naples National Archaeological Museum. 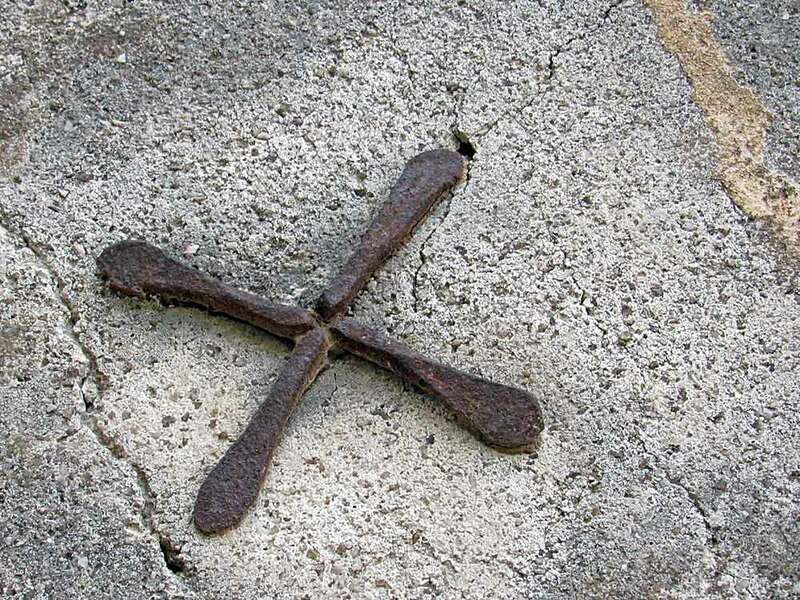 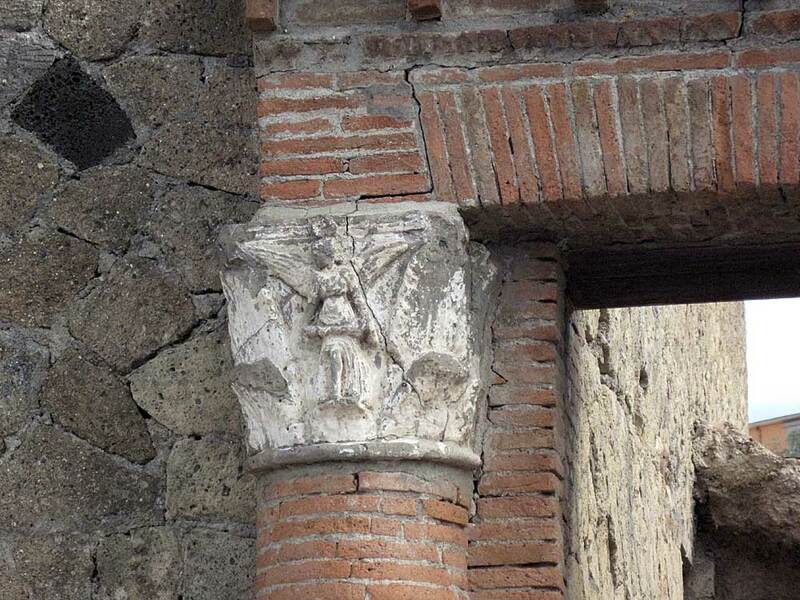 The black charcoal-like timber cross beams found in many of the buildings is original. 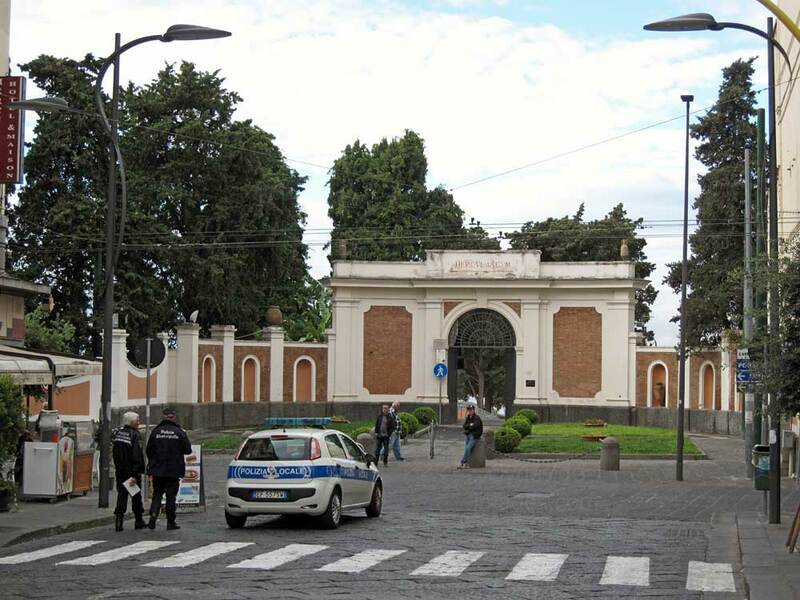 Left: This is the College of the Agustales. 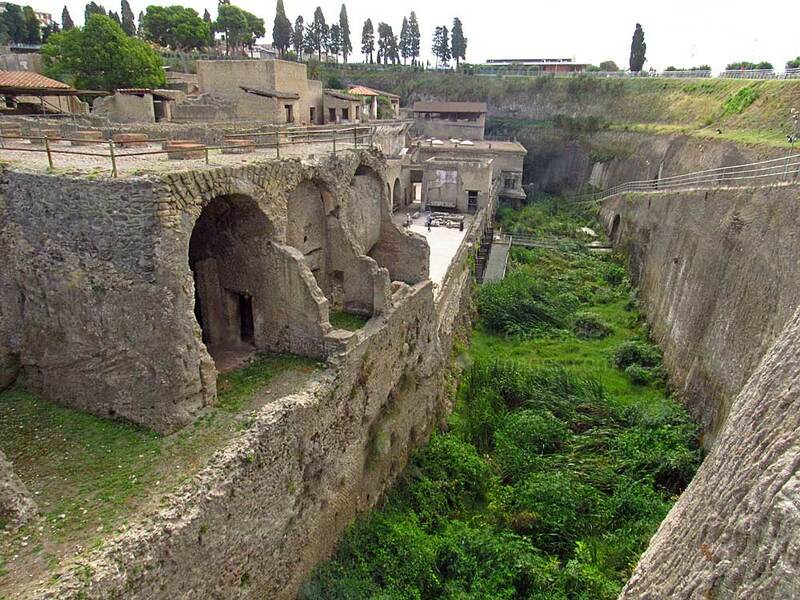 The Augustales were members of an order dedicated to the imperial cult and it was built while the Emperor Augustus was still alive. 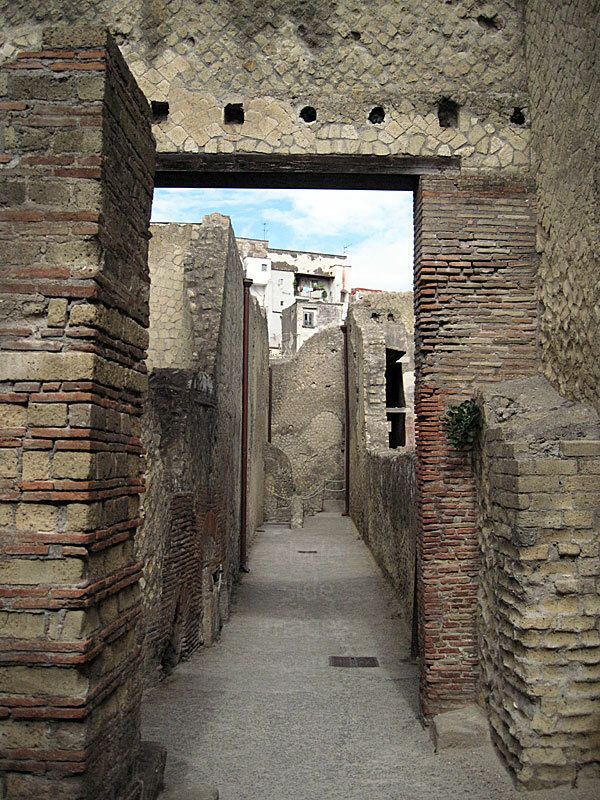 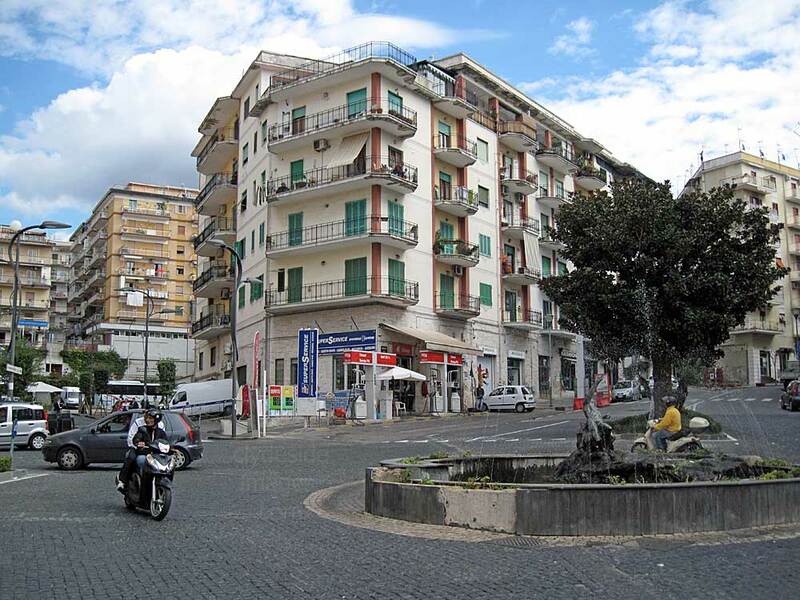 The college stands on the corner of Decamanus Maximus and upper Cardo III and had two entrances, one on each of these streets. 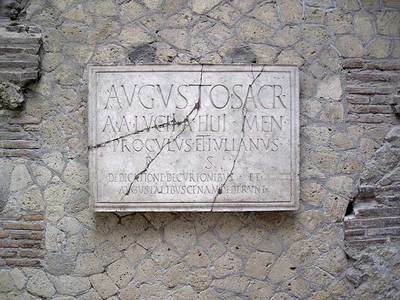 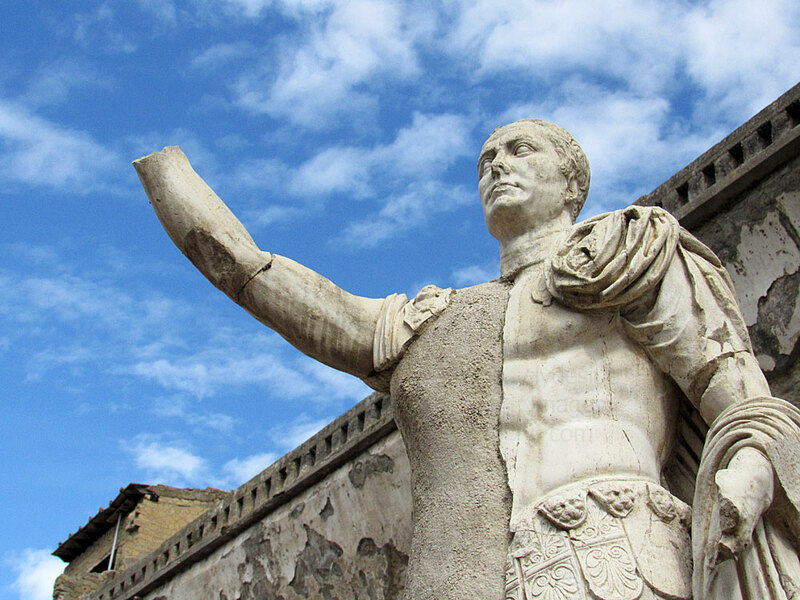 The construction costs were financed by two brothers, Aulus Lucius Proculus and Aulus Lucius Iulianus, who also provided a banquet on the day of its opening. 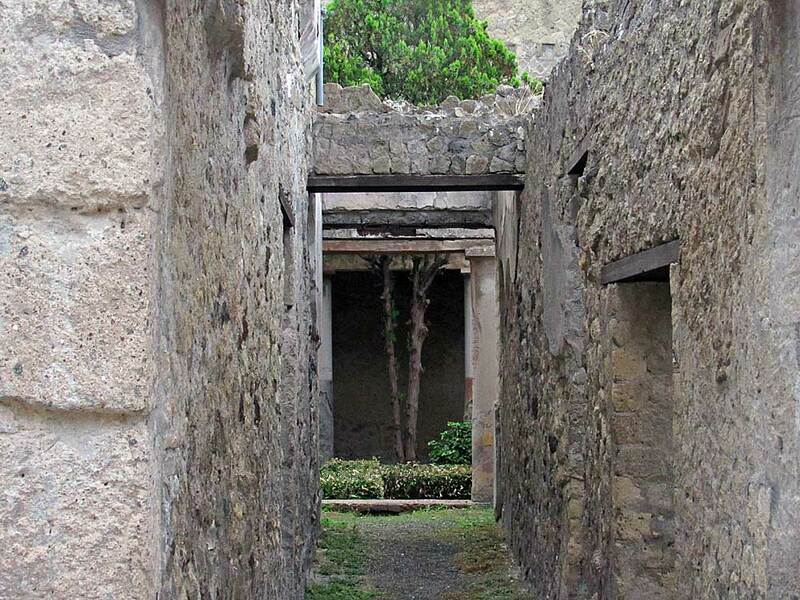 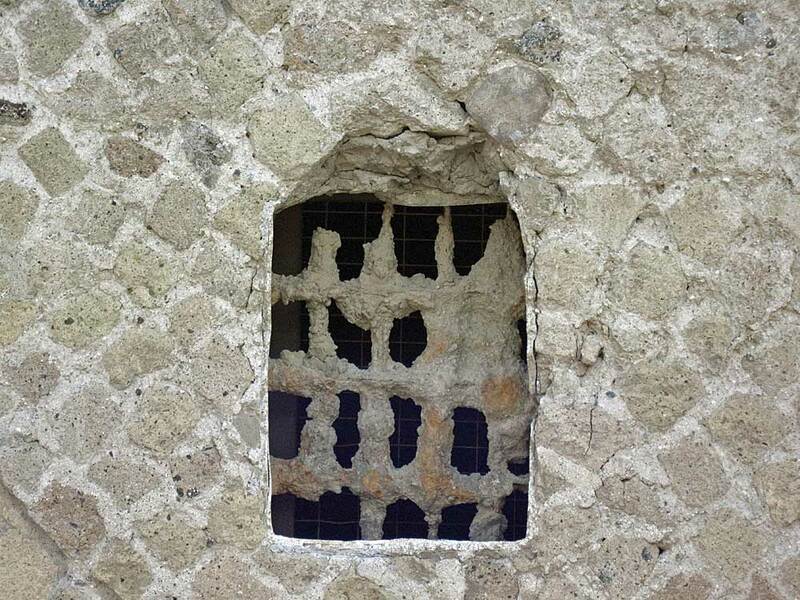 Unlike Pompeii, this and other buildings at Herculaneum have the remains of the original carbonised wooden beams. 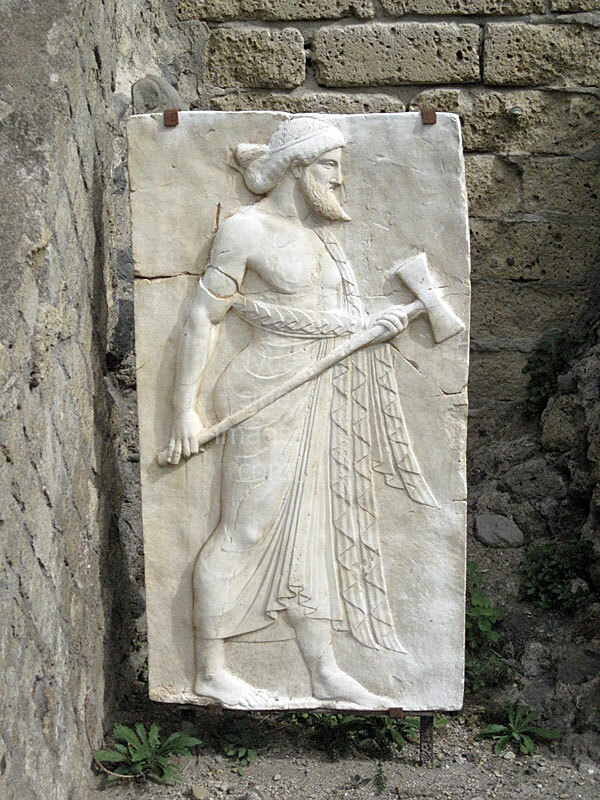 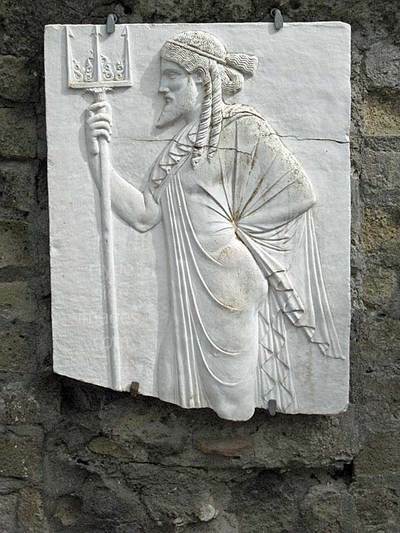 The shrine at the rear of the college is paved with expensive marble while the walls have paintings depicting scenes from Greek mythology including the Hercules entering Mount Olympus, the home of the Greek gods. 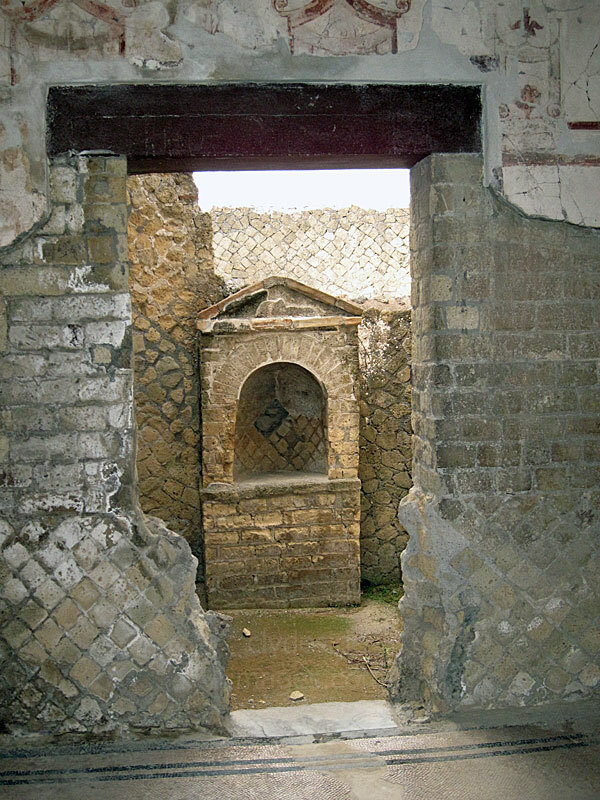 A crude partition in the shrine concealed a small room in which a skeleton of a man was found during excavations. 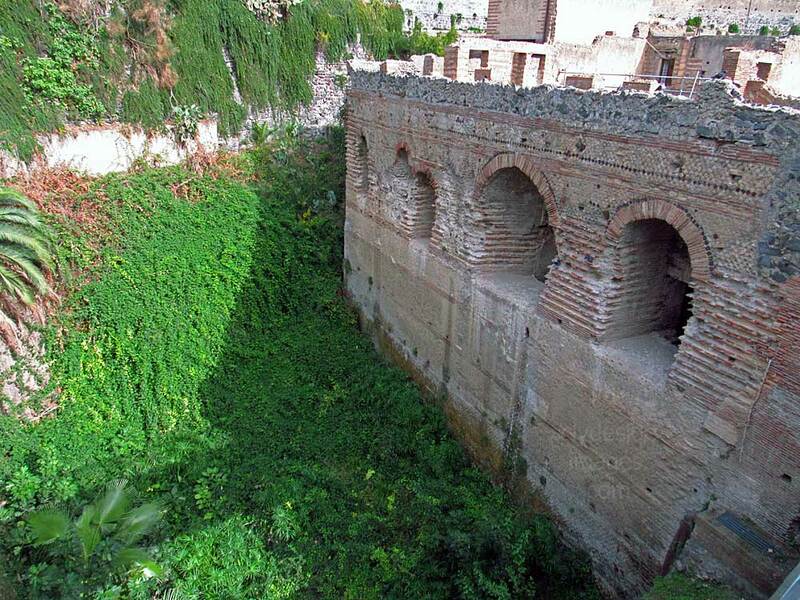 The most fascinating but macabre aspect of the doomed city is found at the lowest level of the complex, in chambers alongside what appears to be a moat. This actually marks what would have been the shoreline in ancient times and thousands of people fled to the water’s edge here, hoping to escape by boat, in a futile attempt to avoid the volcano’s poisonous gasses and ferocious heat generated by the eruption. 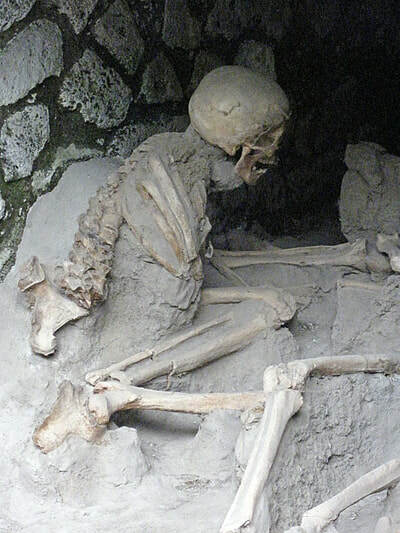 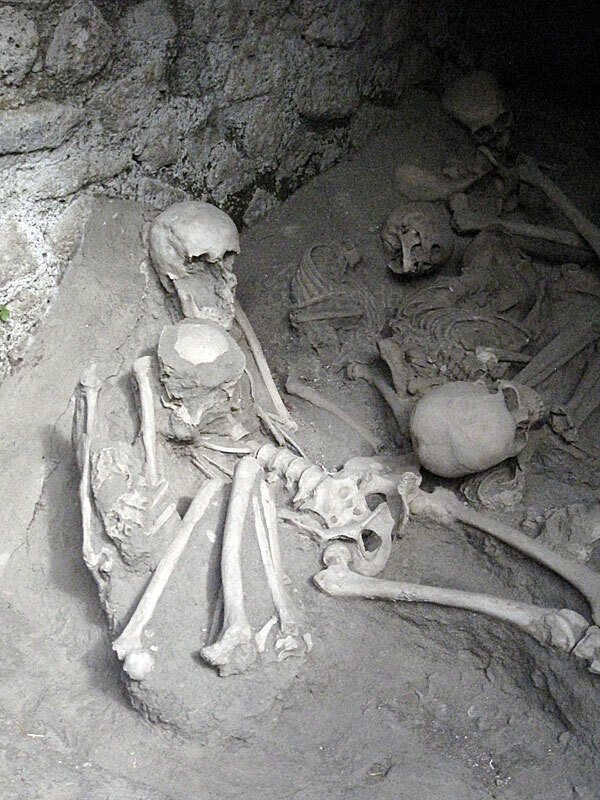 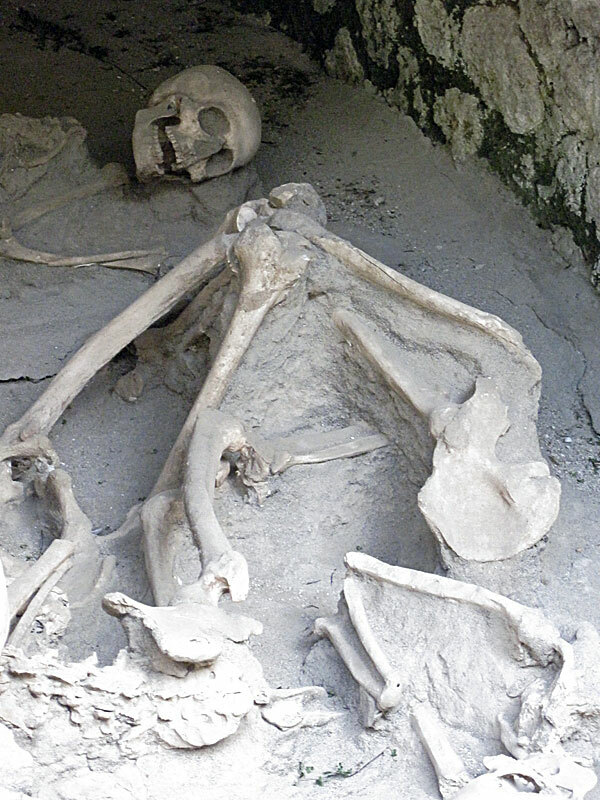 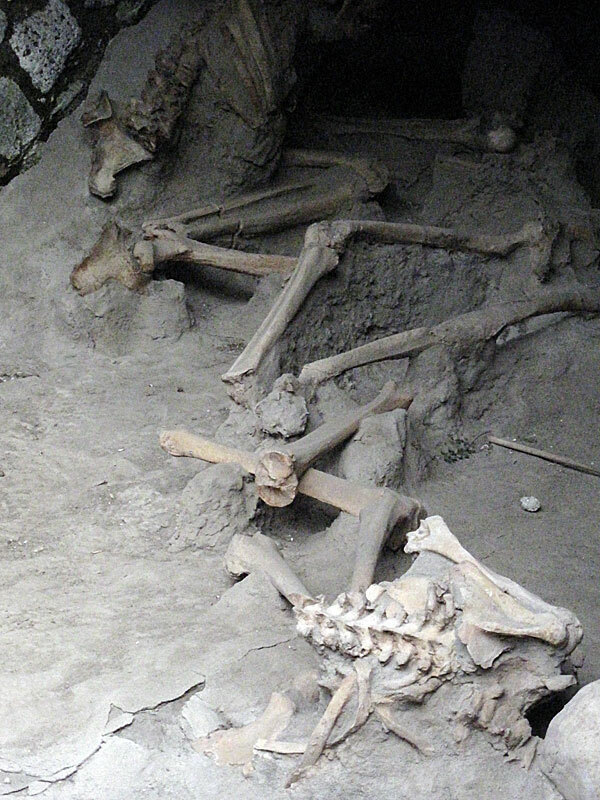 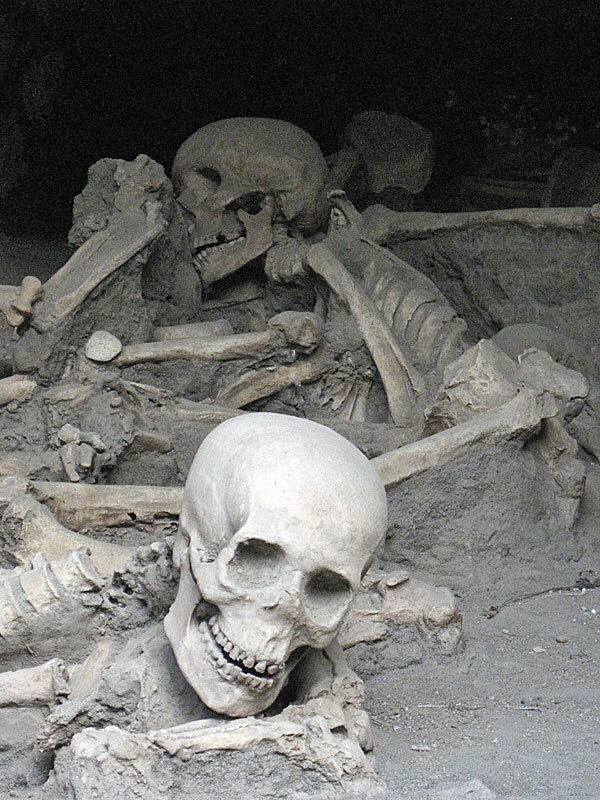 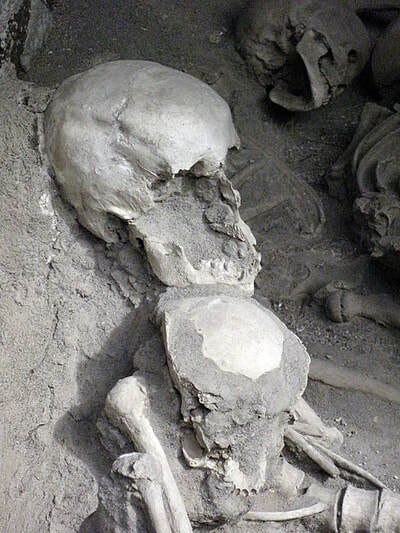 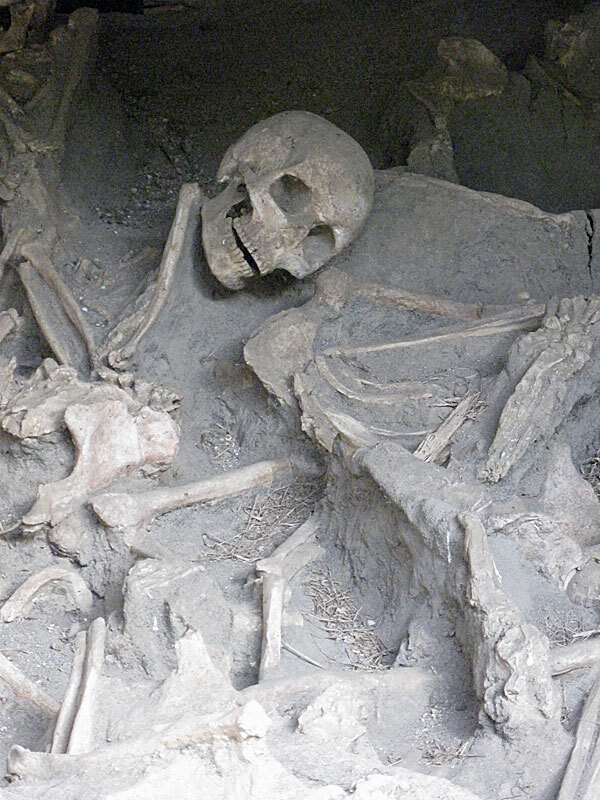 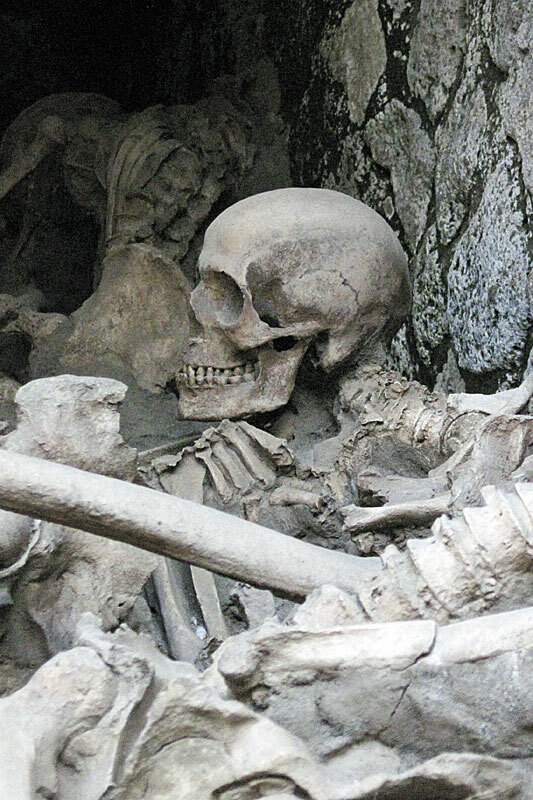 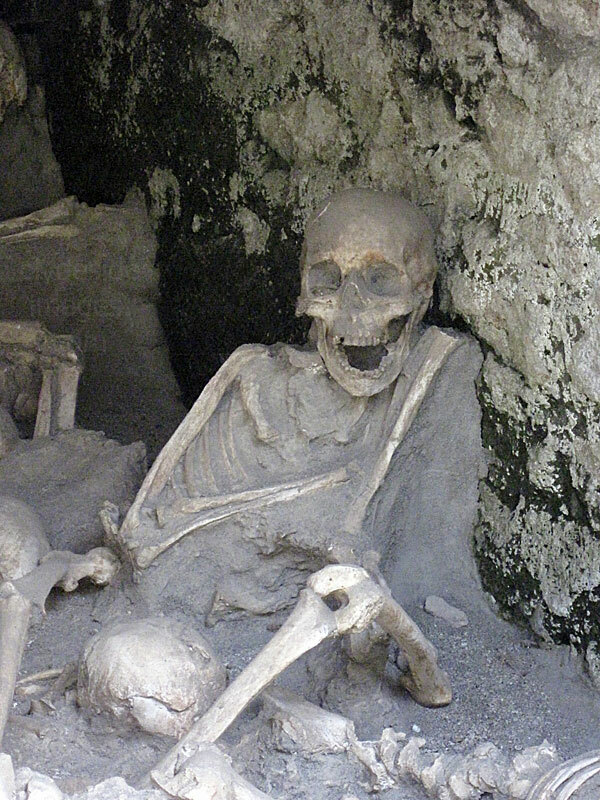 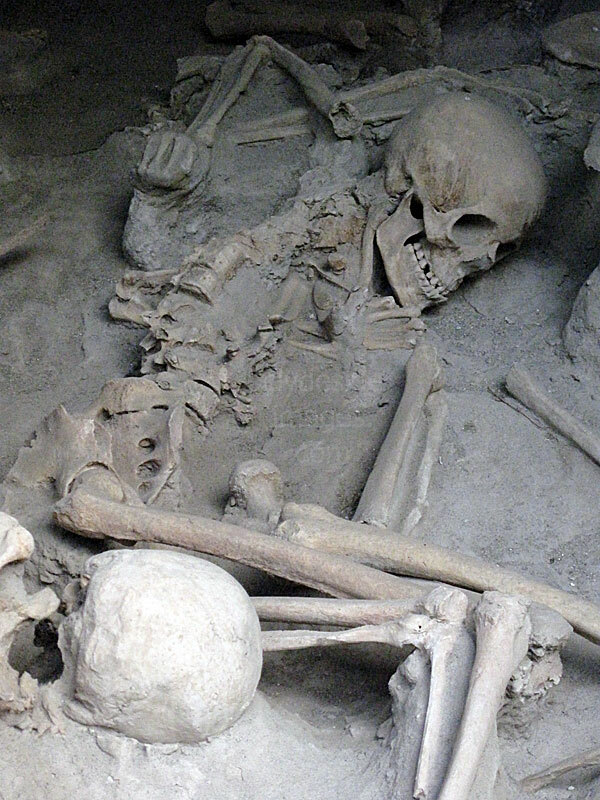 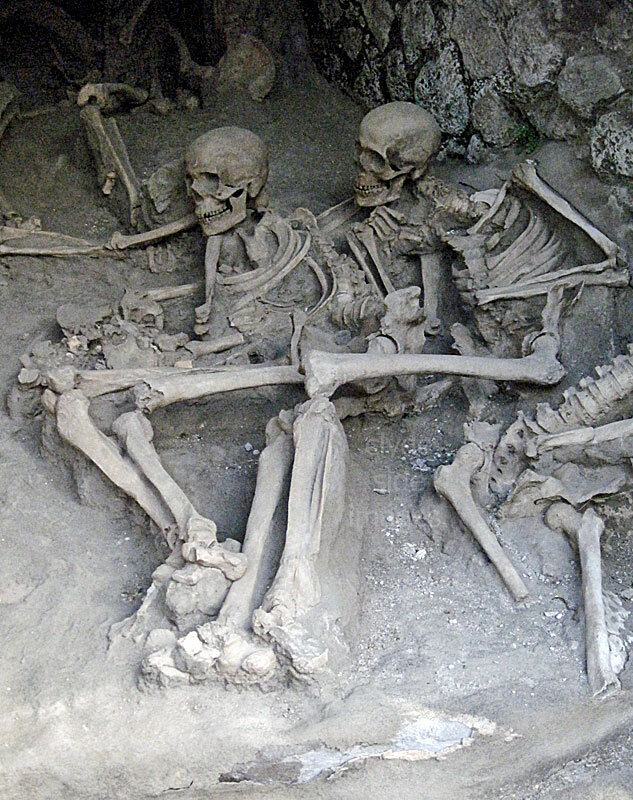 In 1980, archaeologists discovered some 300 skeletons, the remains of a large group of people that had reached the beach only to be overcome by the ferocious heat and suffocated by clouds surging down from the volcano.